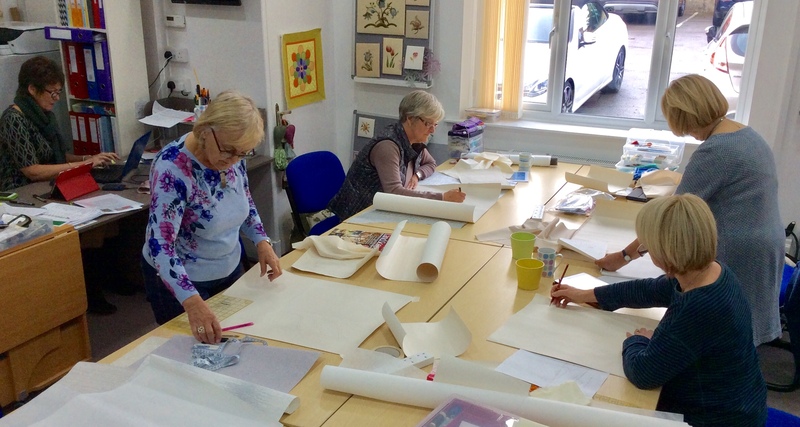 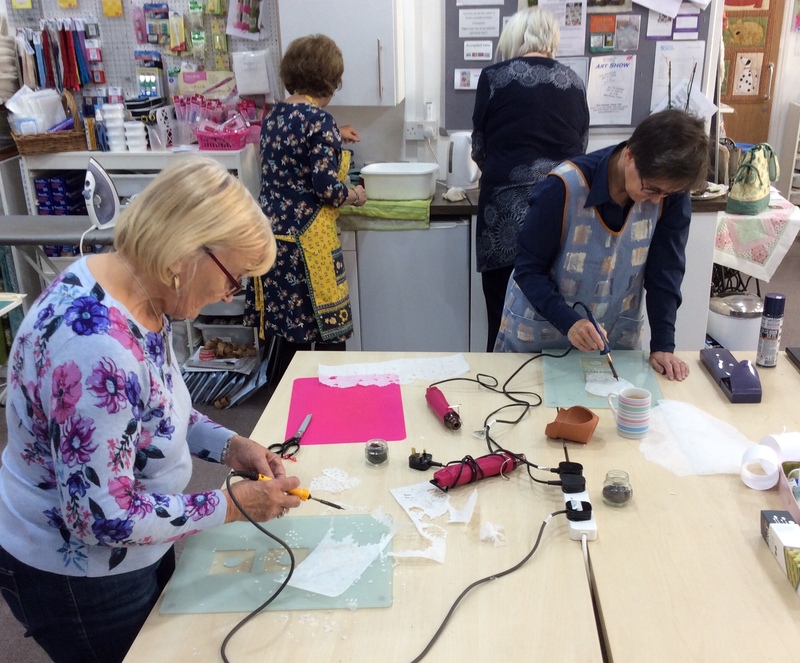 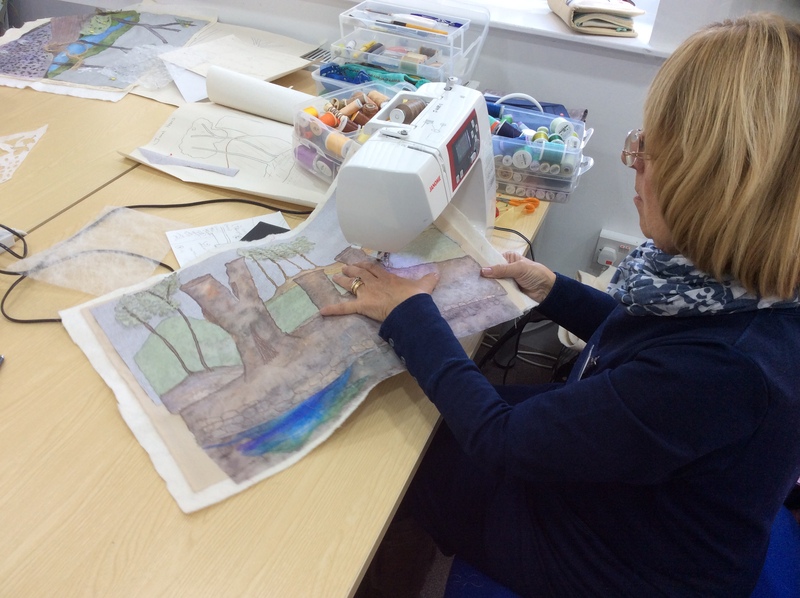 Tall Trees – Day Two…..
It’s a hive of activity at Simply Stitch in Wetherby this morning…..the snow is falling fast outside so the ladies are stitching like fury in order to finish their quilts before we get snowed in! 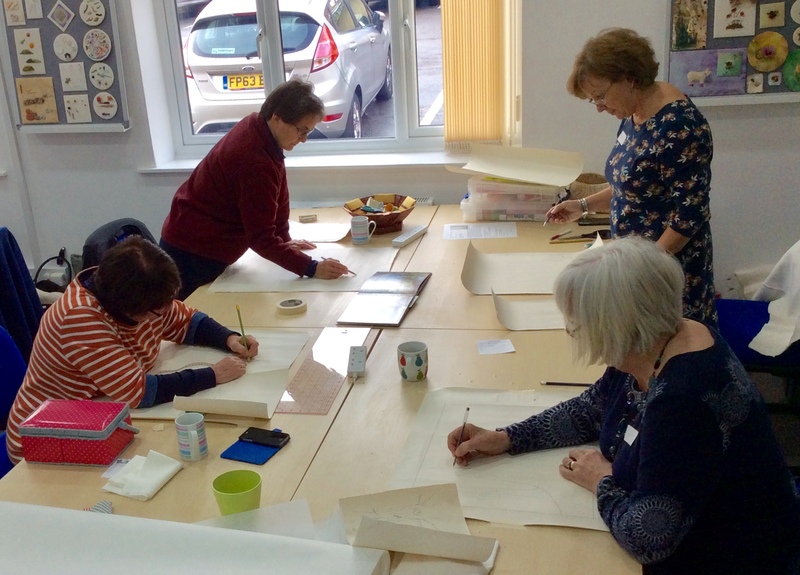 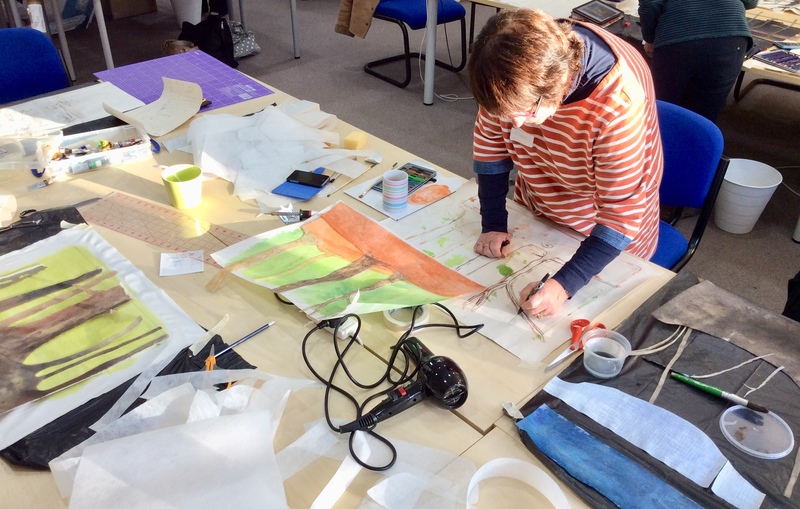 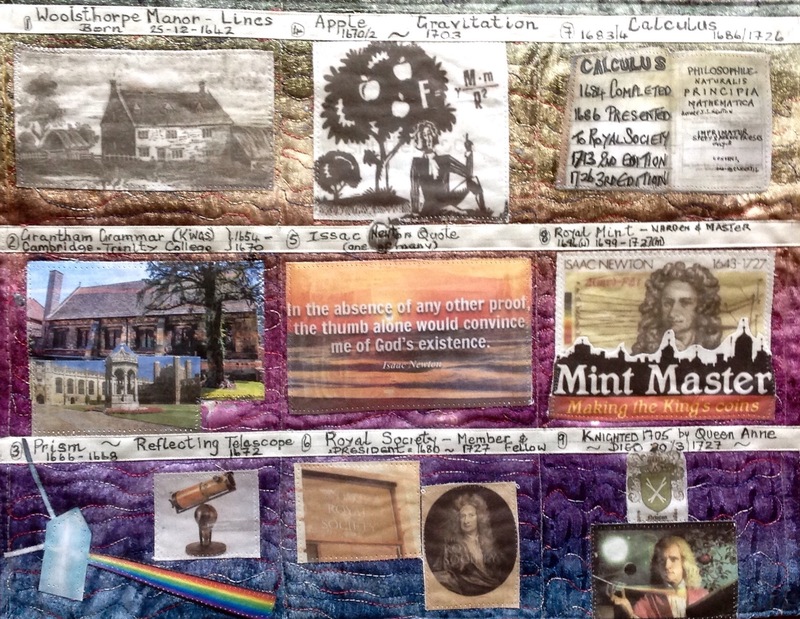 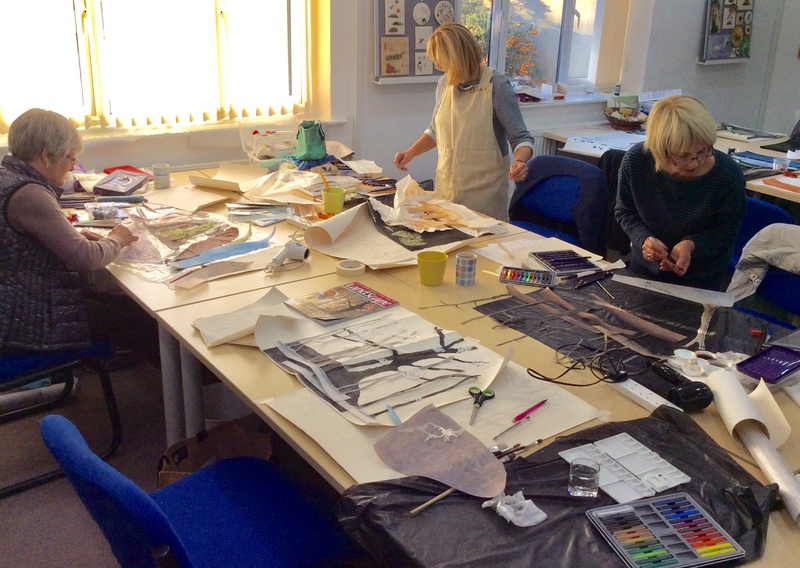 Inspired by Sir Isaac Newton…..
One of the textile groups I belong to is LINQS (Lincolnshire Quilters) and each year we respond to a challenge to make an art quilt based on the life or works of a particular person. 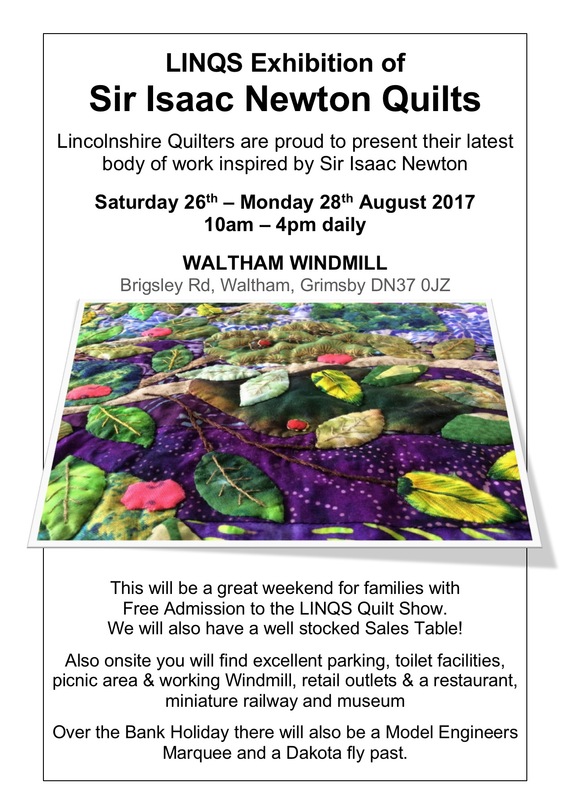 Our latest challenge was inspired by Sir Isaac Newton and the work will be on display over the coming bank holiday weekend at Waltham Windmill. 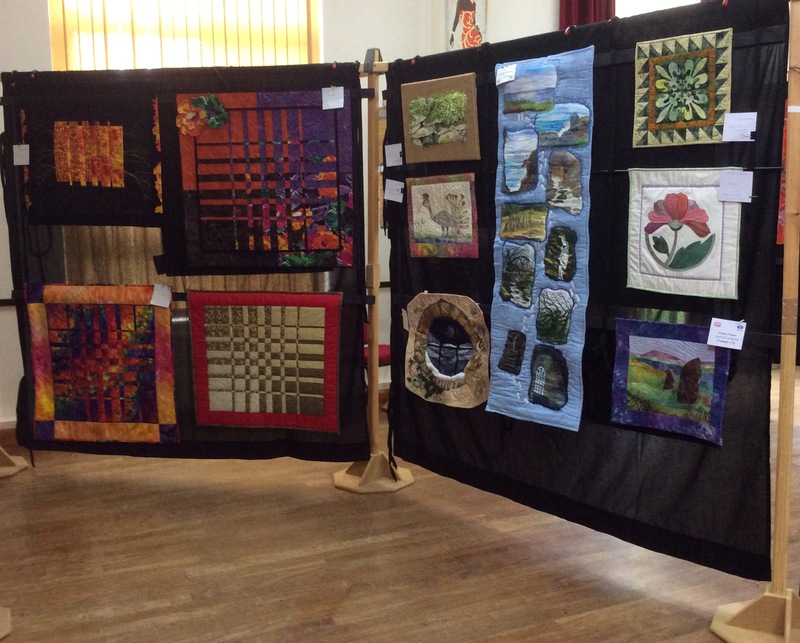 The exhibition is free and we will be having a sales table and demonstration area. 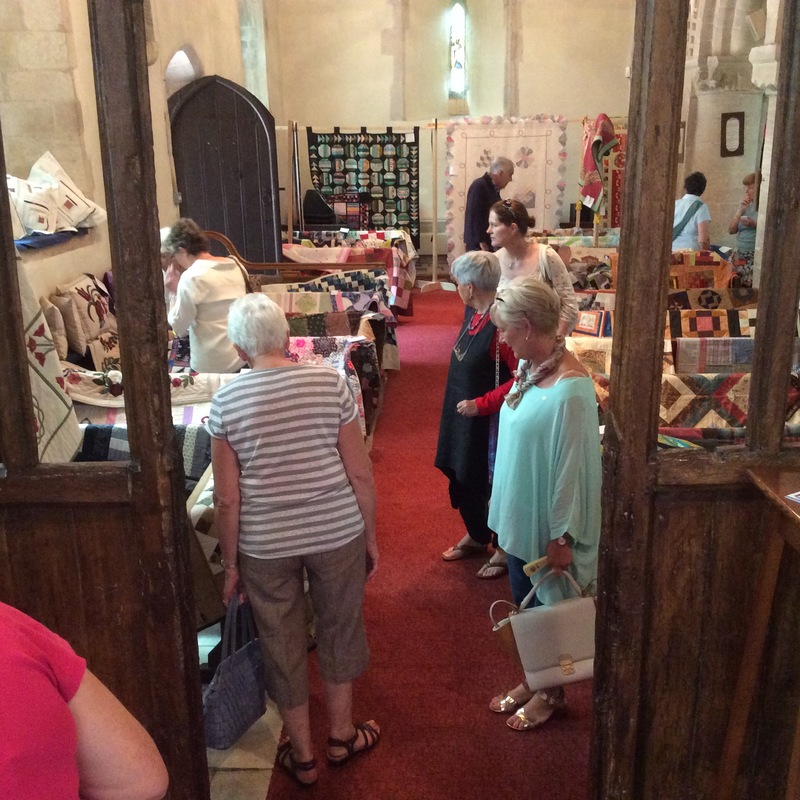 There will be lots of other things going on at the working Mill with shops, cafes, picnic area, miniature train rides and a model engineers marquee, etc so a great venue for a family day out! 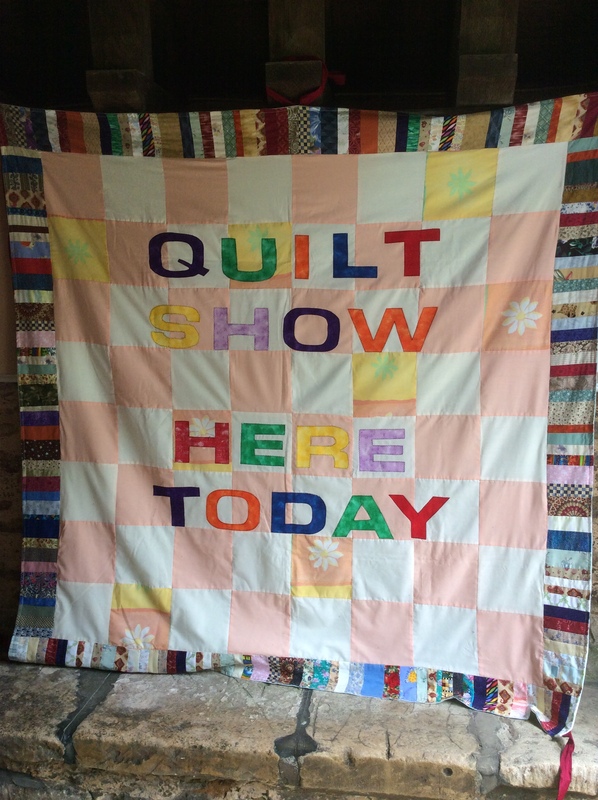 The exhibition is open from 10am – 4 pm on the Saturday, Sunday and Monday. 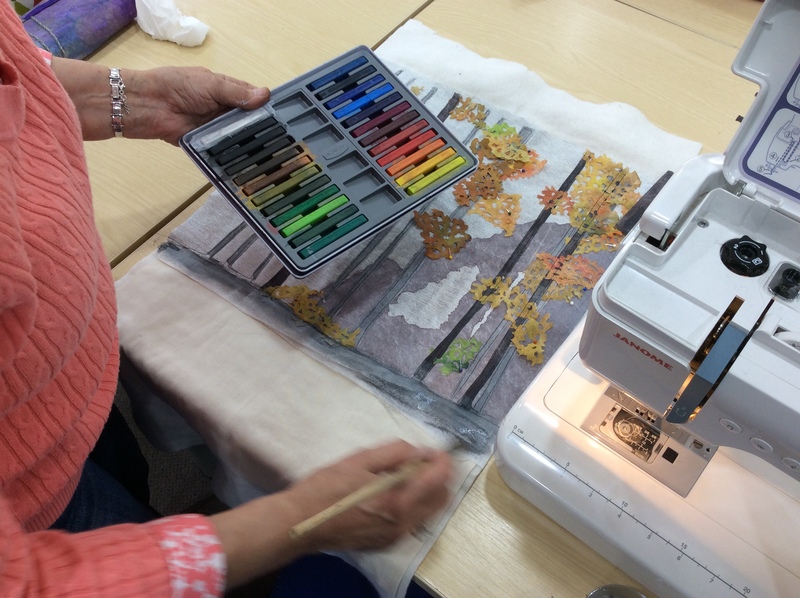 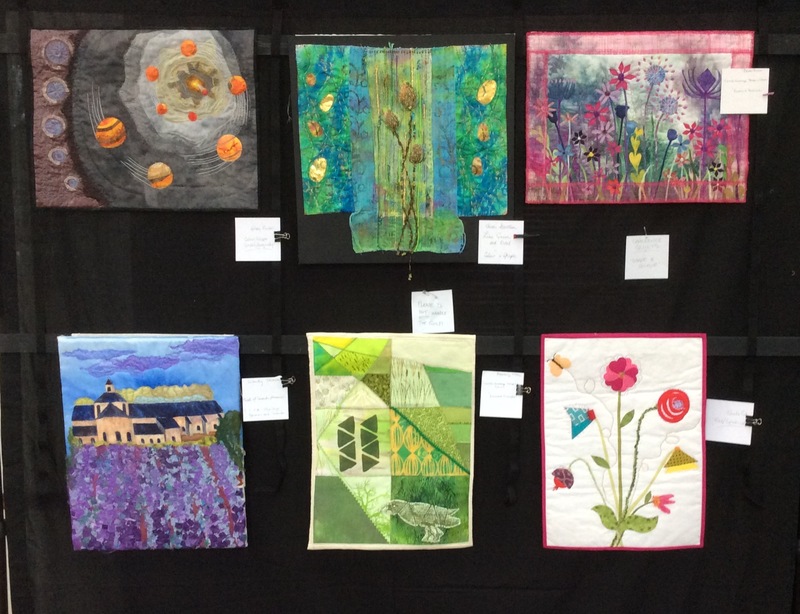 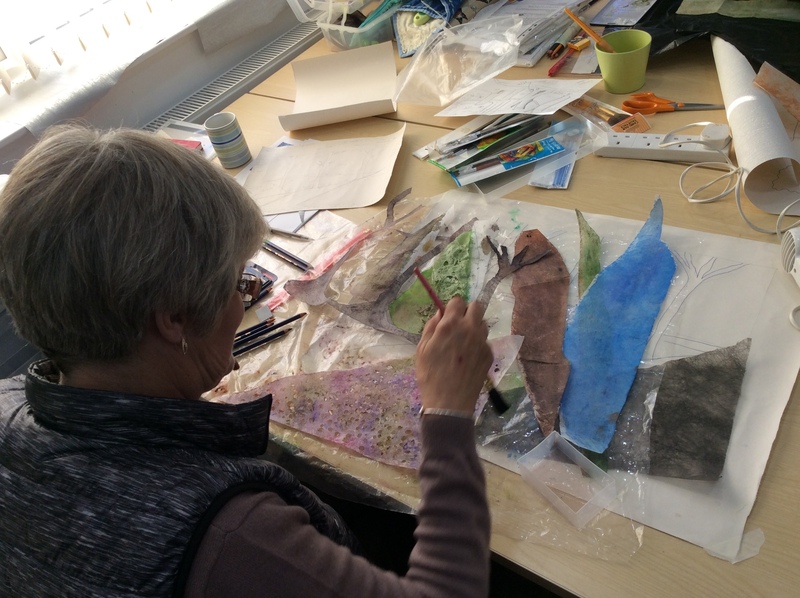 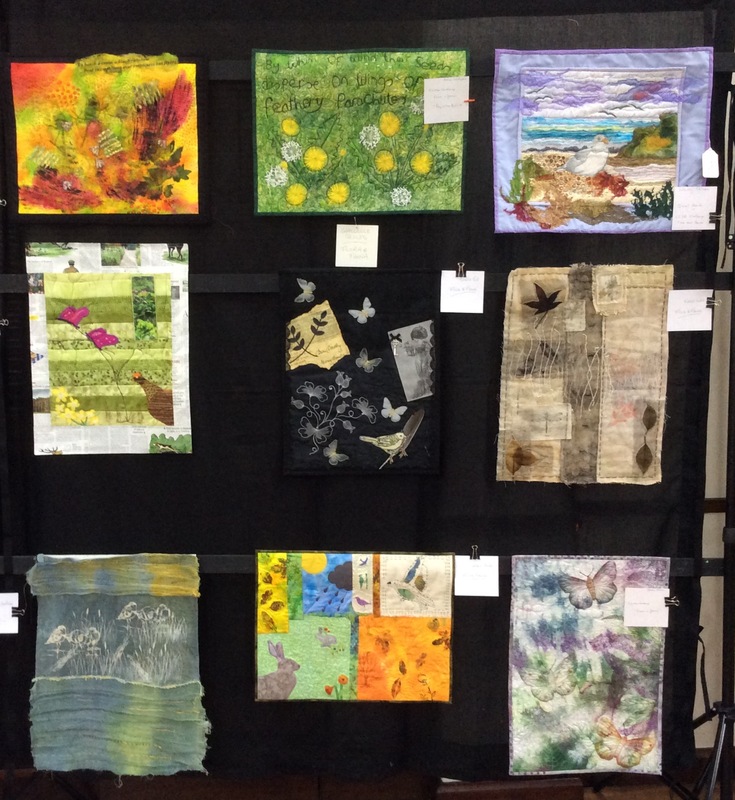 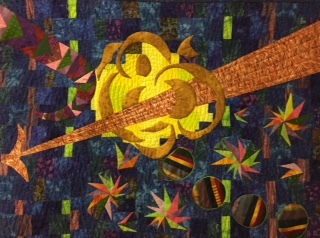 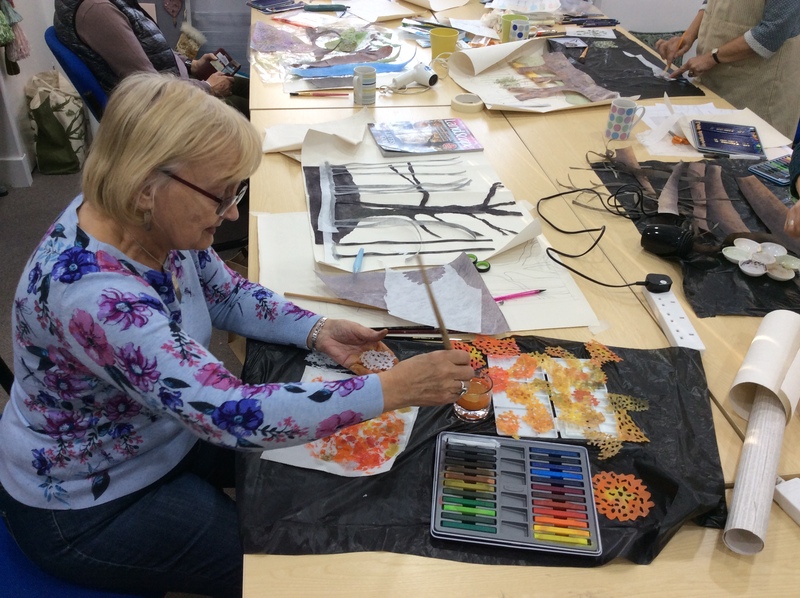 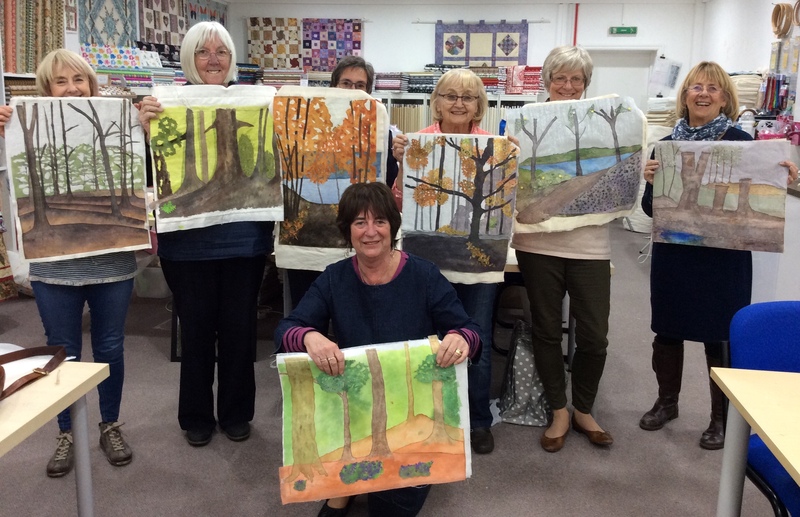 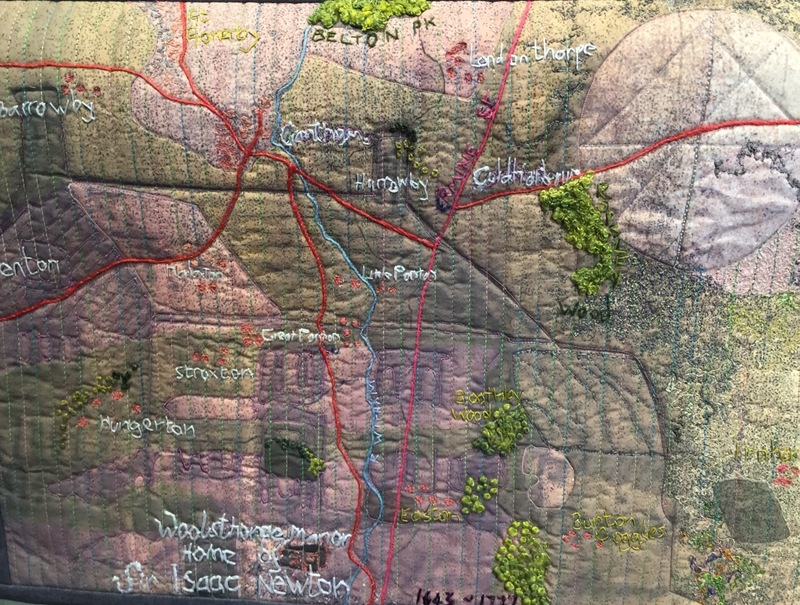 Here are just a few examples of what we have on show…..
LINQS (Lincolnshire Quilters) will be exhibiting their latest body of work, 22 art quilts inspired by Sir Isaac Newton, at the end of this month. 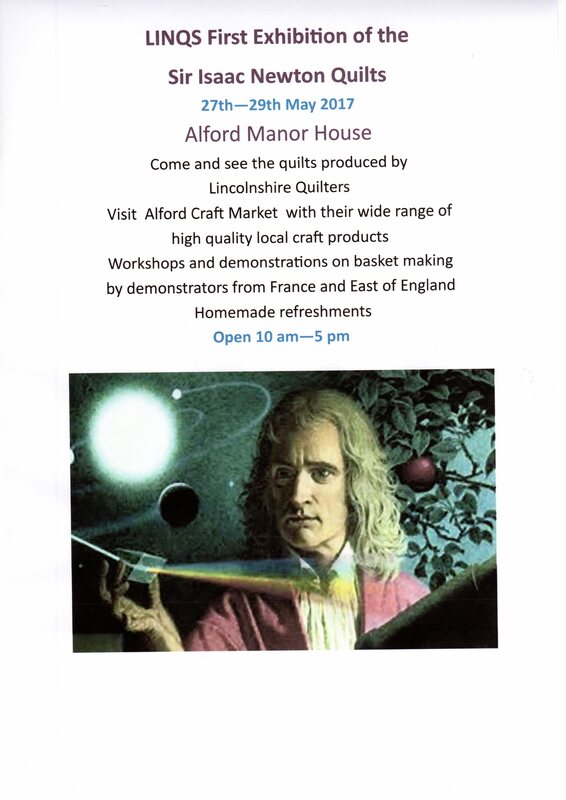 Our first venue will be the beautiful Alford Manor House. 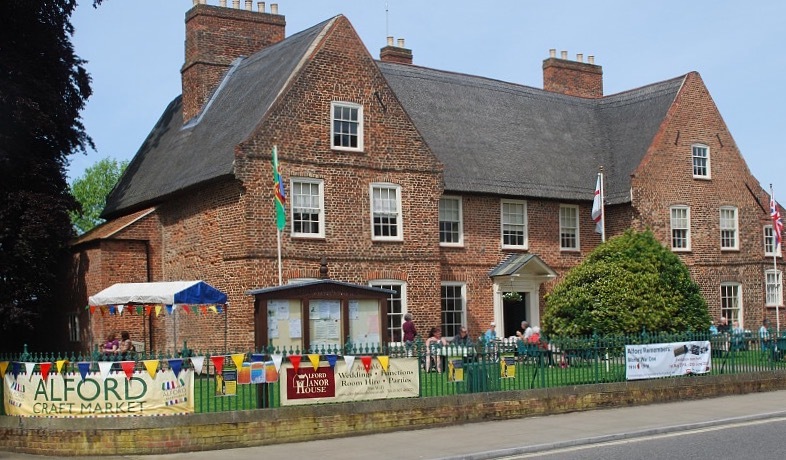 Built in 1611 it is thought to be the largest thatched manor house in the country. 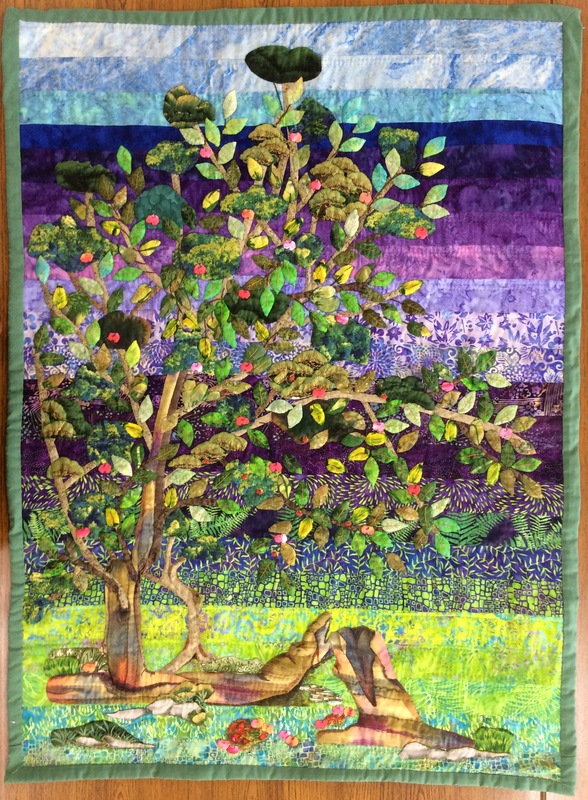 I’ve finally finished my Newton quilt. 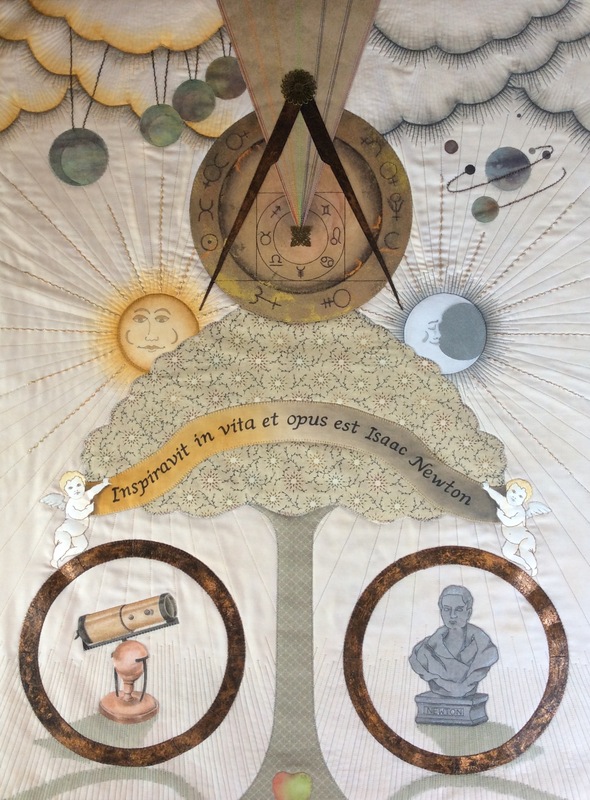 It’s 30″ x 40″ and the design is based on the fact that Newton spent a lot of his time studying and practising alchemy. 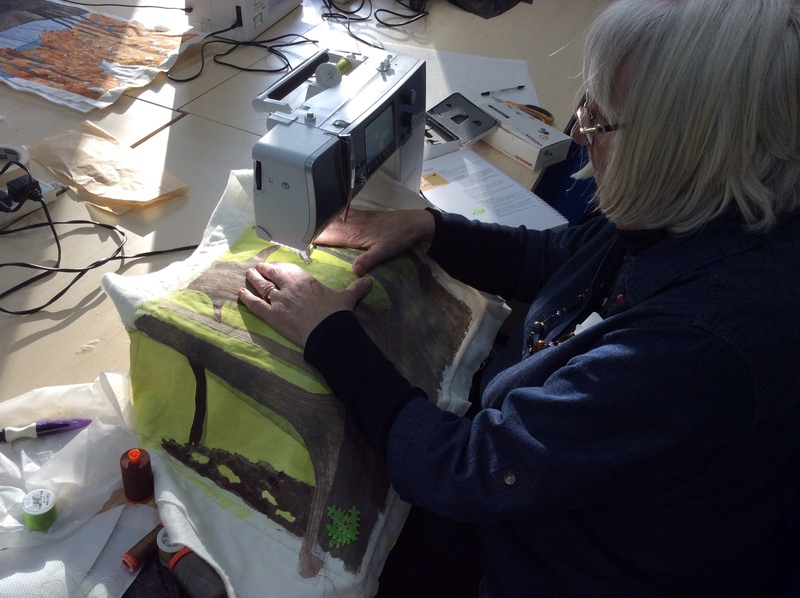 It consists of appliqué commercial fabric, Tyvek and painted vilene applied to a background of tea stained cotton fabric. 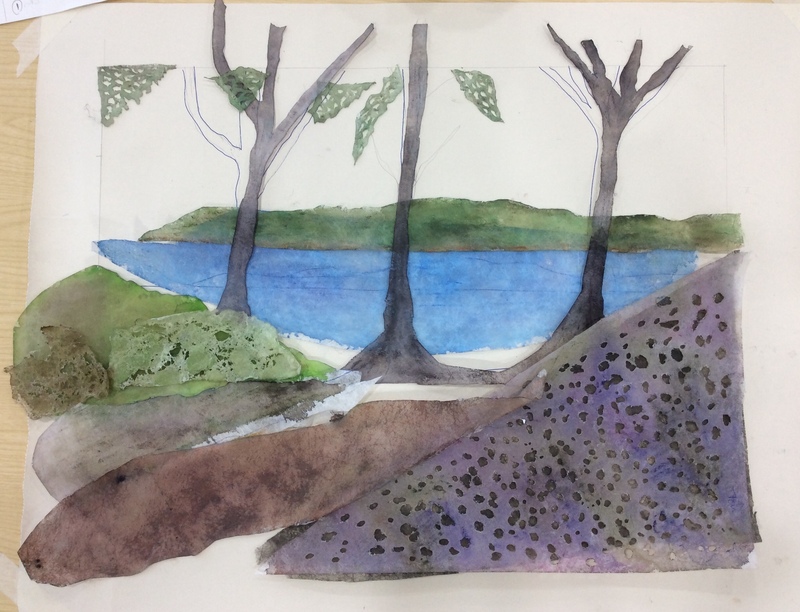 Other materials used include oil pastels, Inktense, permanent marker pen and metallic foil. 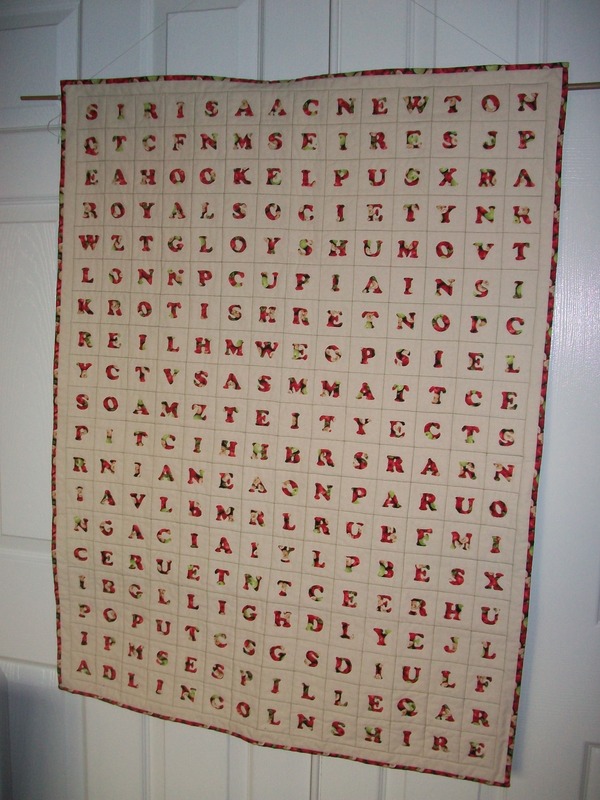 This next quilt Is called “Wordsearch” and there are thirty words to find, all relating to life of Isaac Newton. 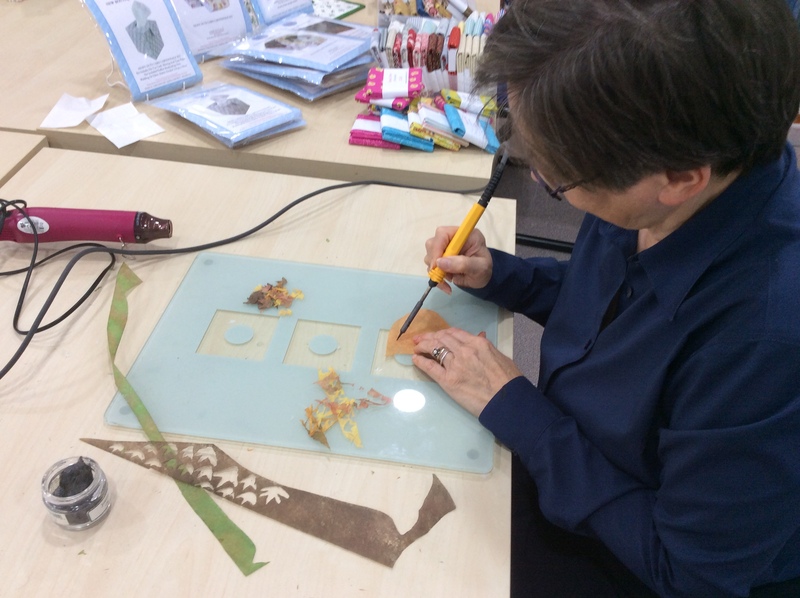 An ingenious way of stopping visitors in their tracks and making them really scrutinise your work! 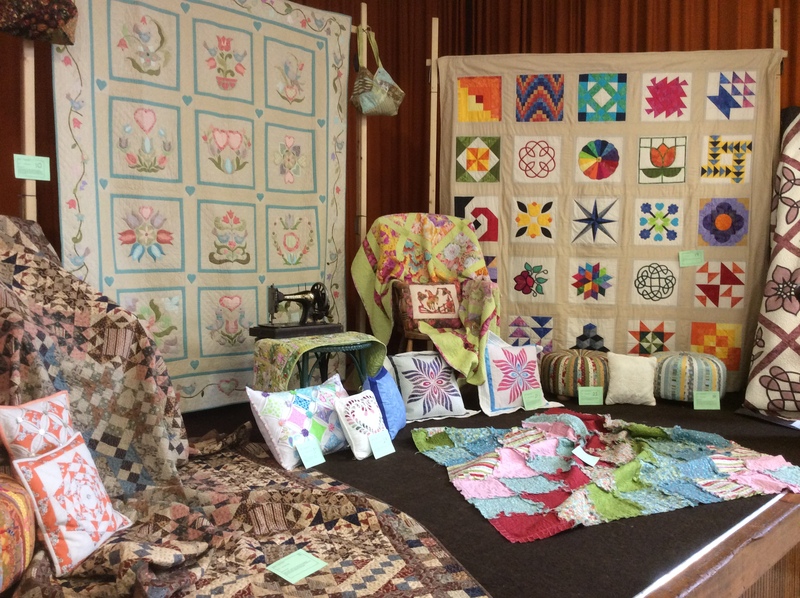 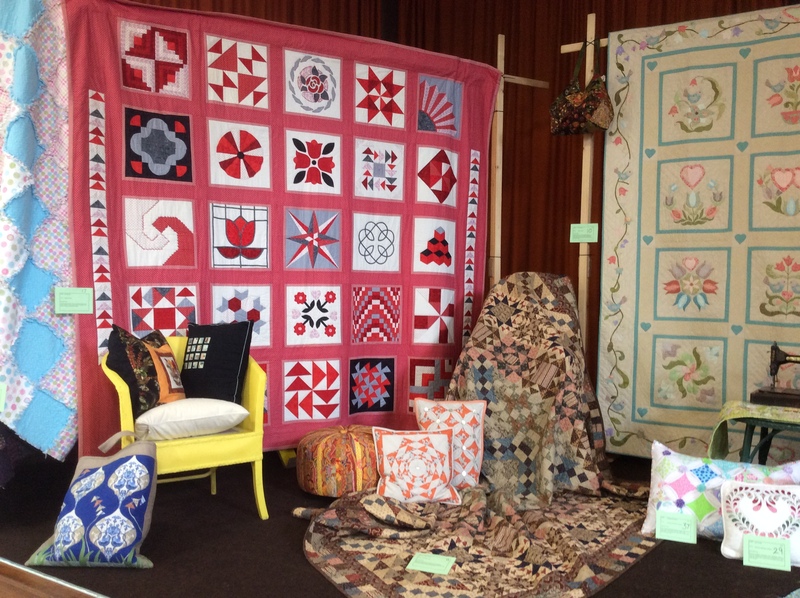 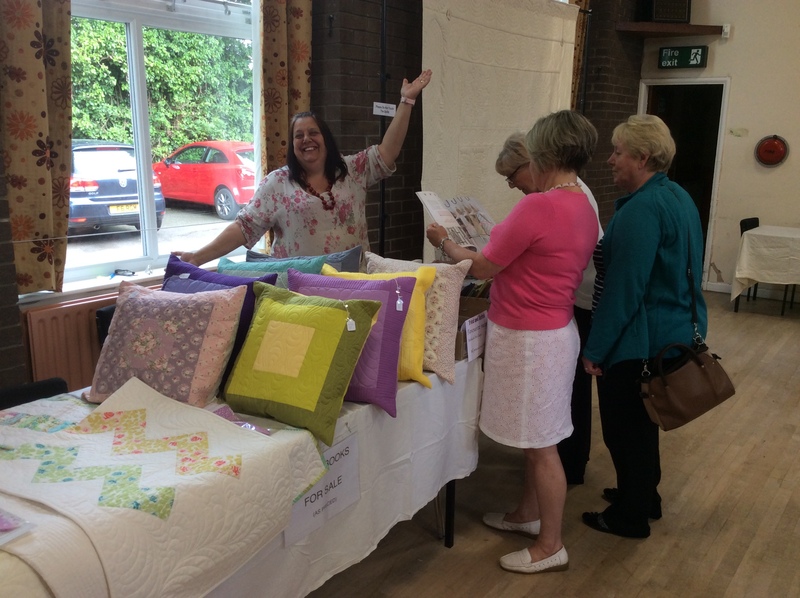 This weekend the two Cranwell groups, Crafty Ladies & Cranwell Contemporary Textiles, held their first ever quilt show. 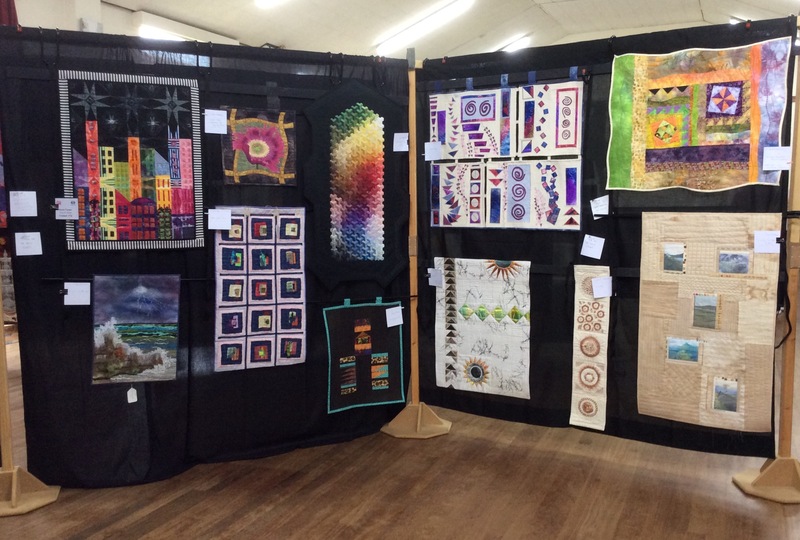 I’ve been a member for just over a year and during that time have seen many wonderful pieces of work produced by the members but to actually see all of this work, and more, displayed together was amazing! 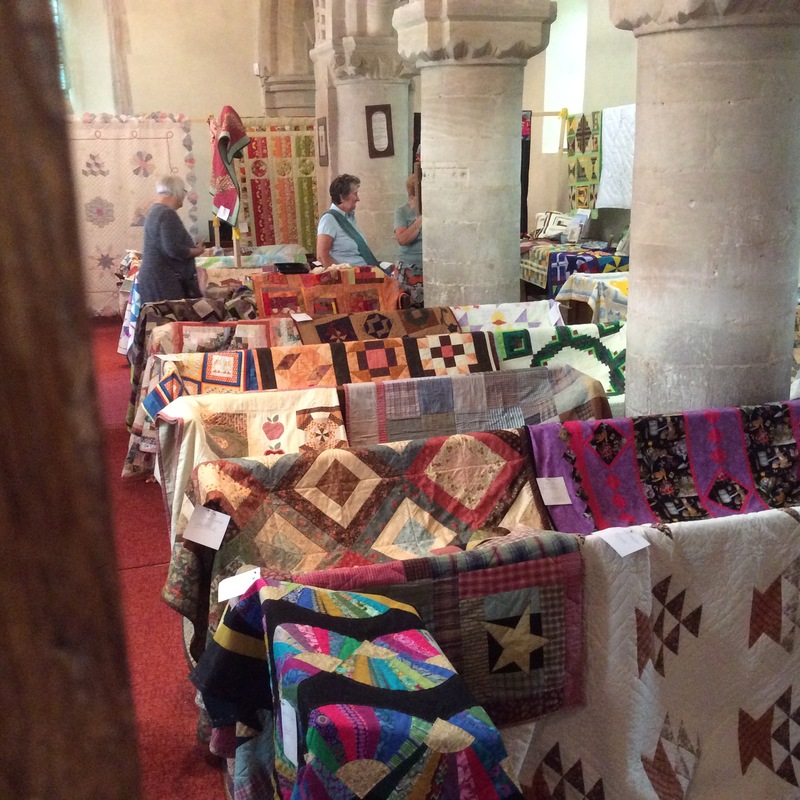 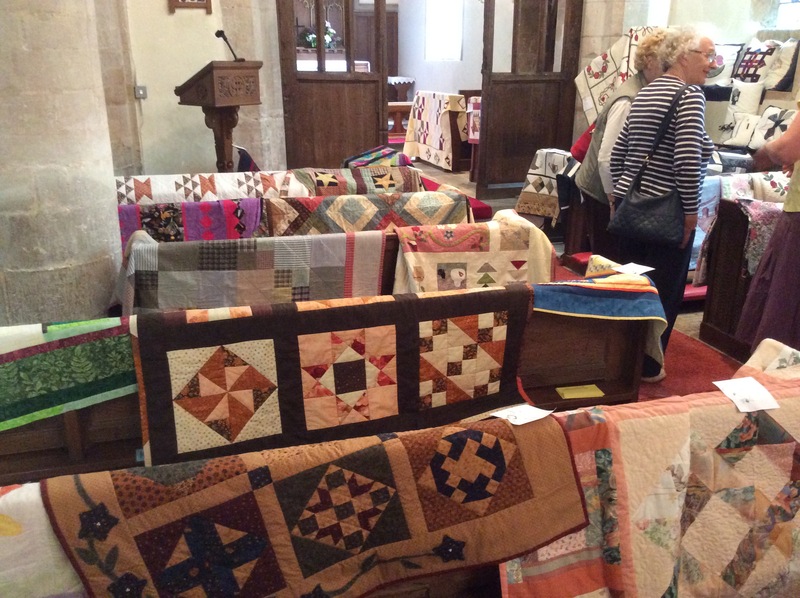 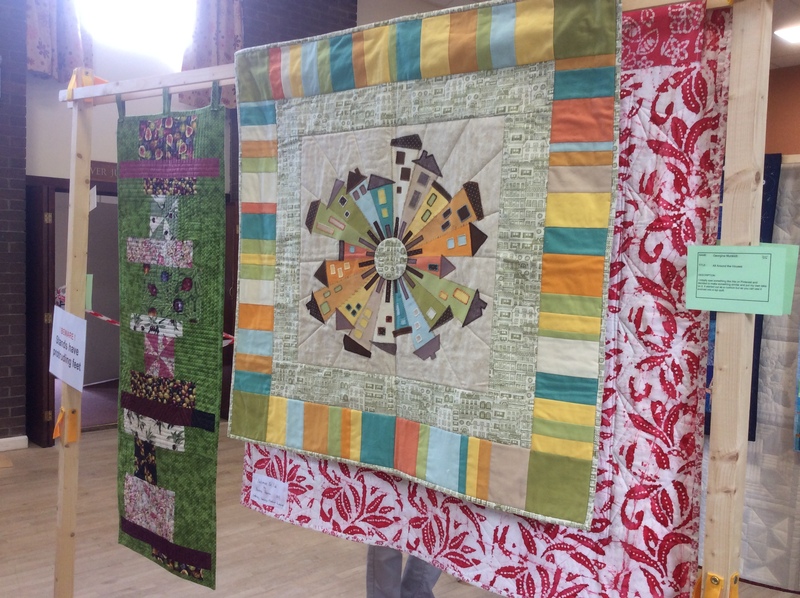 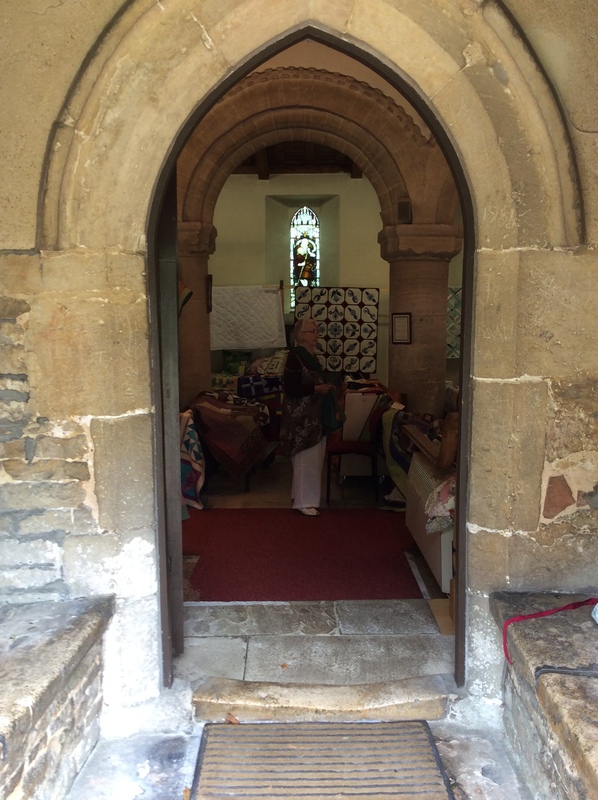 The show was split between two venues with the contemporary work by the CCTG in Cranwell village hall and the traditional quilts by Crafty Ladies on quilt stands and draped over the pews in the beautiful village church. 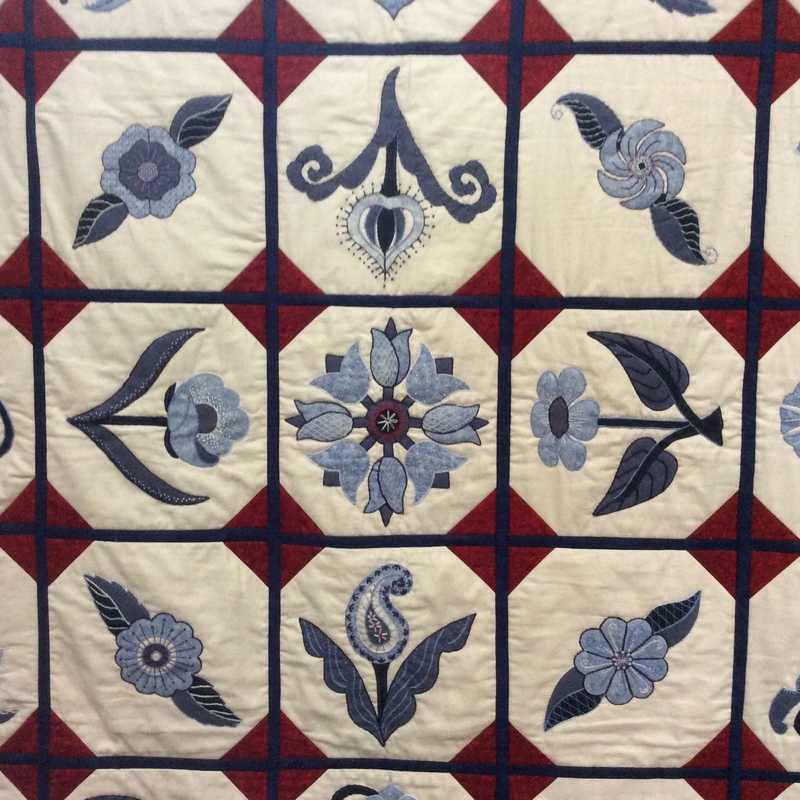 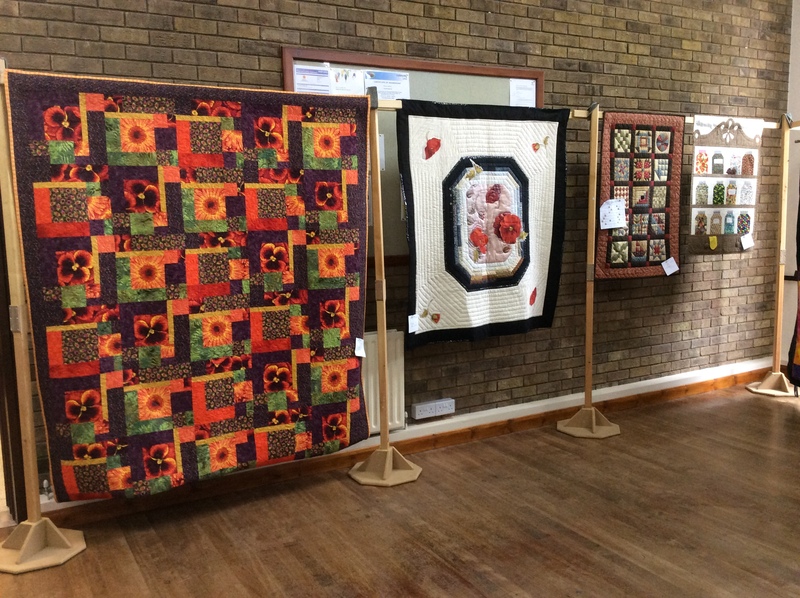 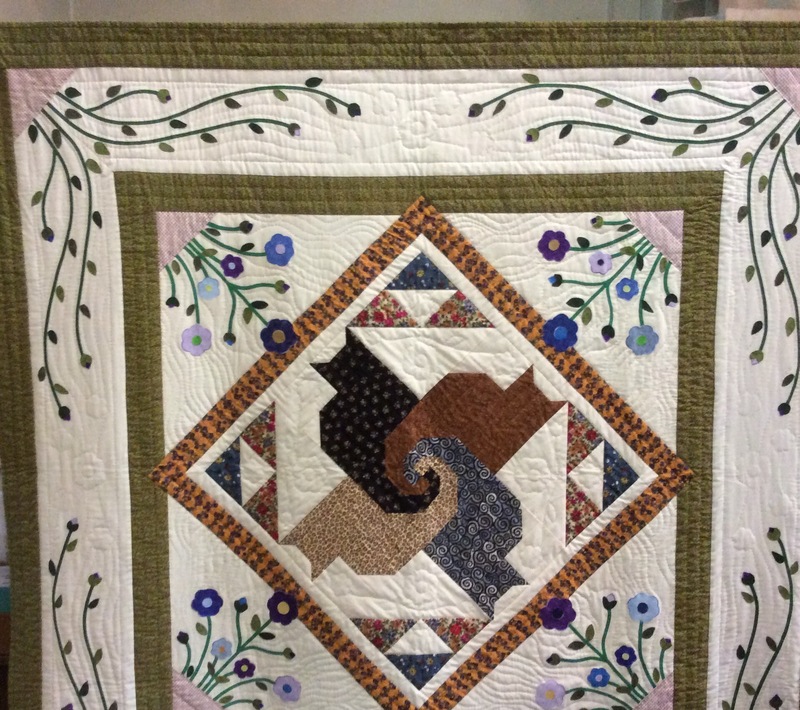 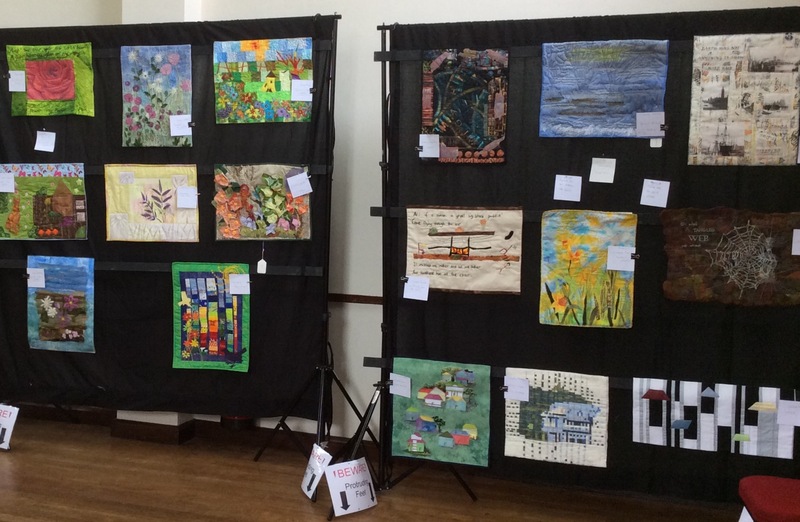 The following photos show a selection of the quilts on display in the hall. 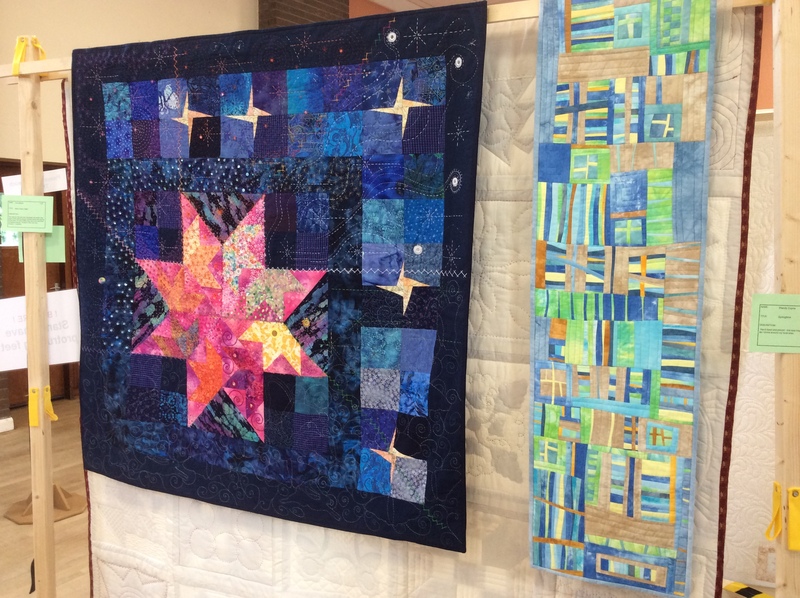 The next four photos are quilts made in response to our themed quarterly “challenges”. 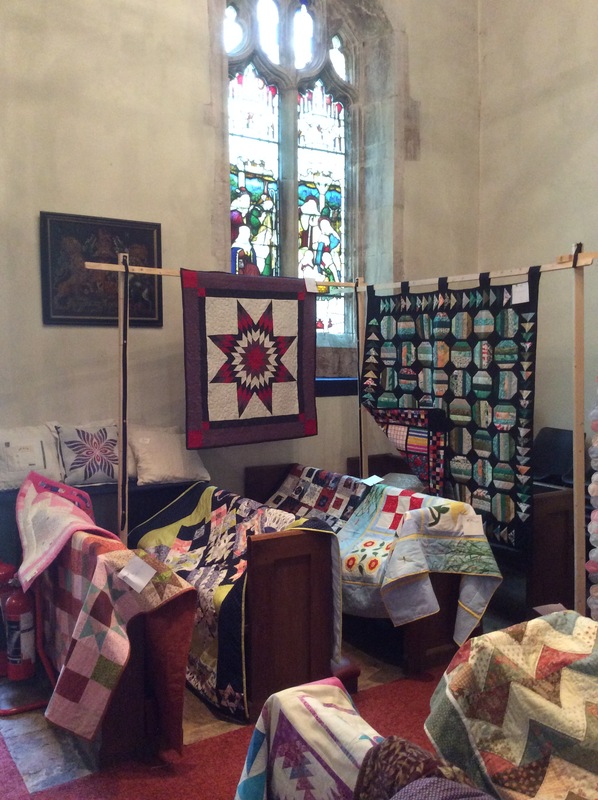 Dedicated to St Andrew, Cranwell church originates circa the 10th century and it made a wonderful venue for the more traditional quilts……. 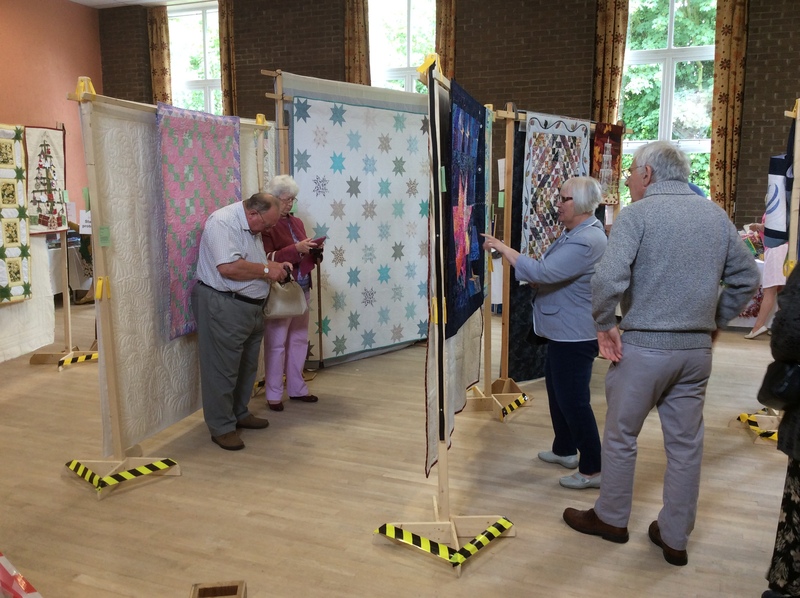 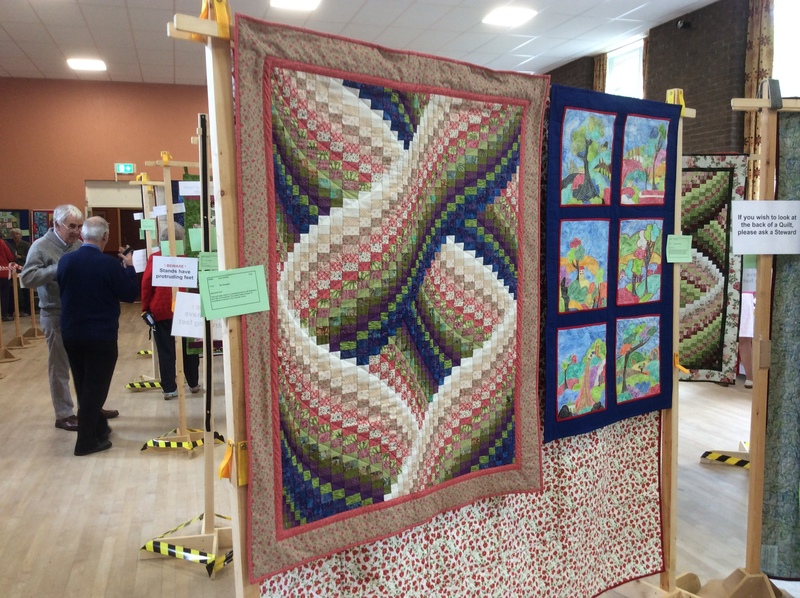 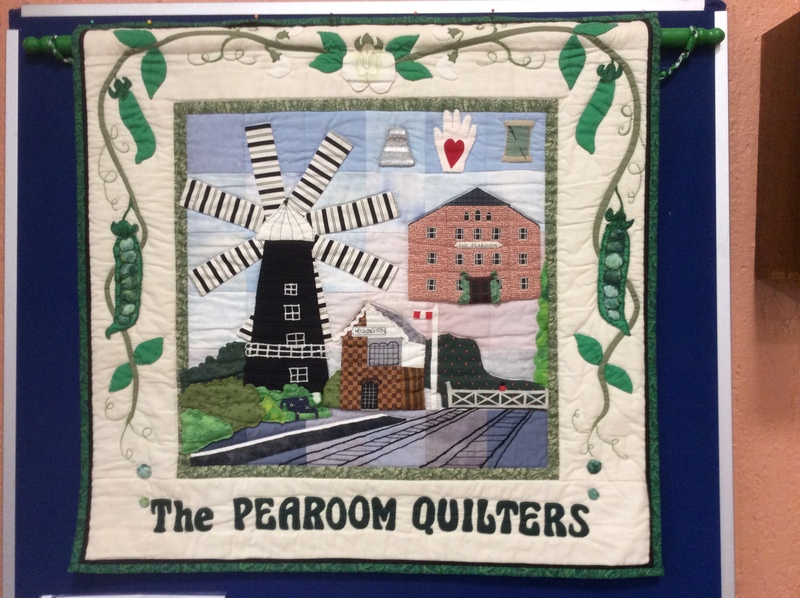 This morning I visited the Pearoom Quilt Show, which is on over the weekend from 10am – 4pm, in Great Hale near Heckington. 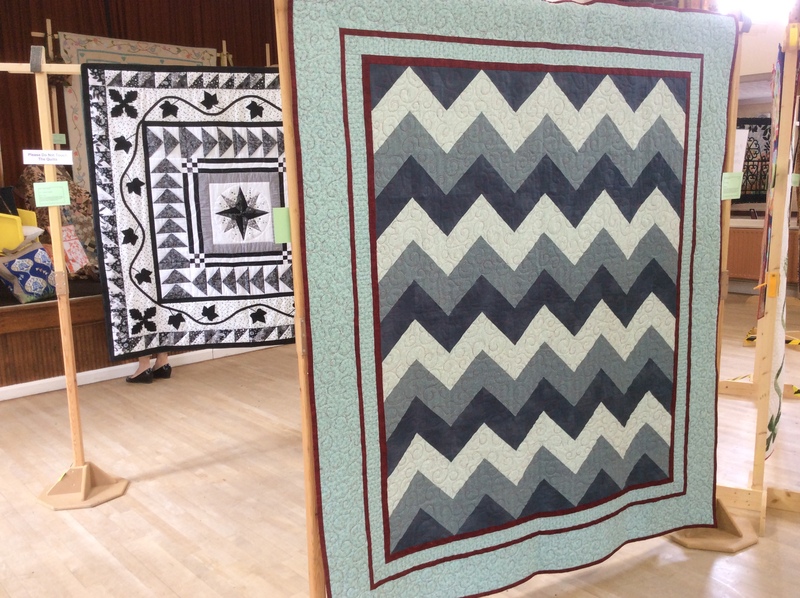 It was nice to see so many friends there and so many beautiful quilts. 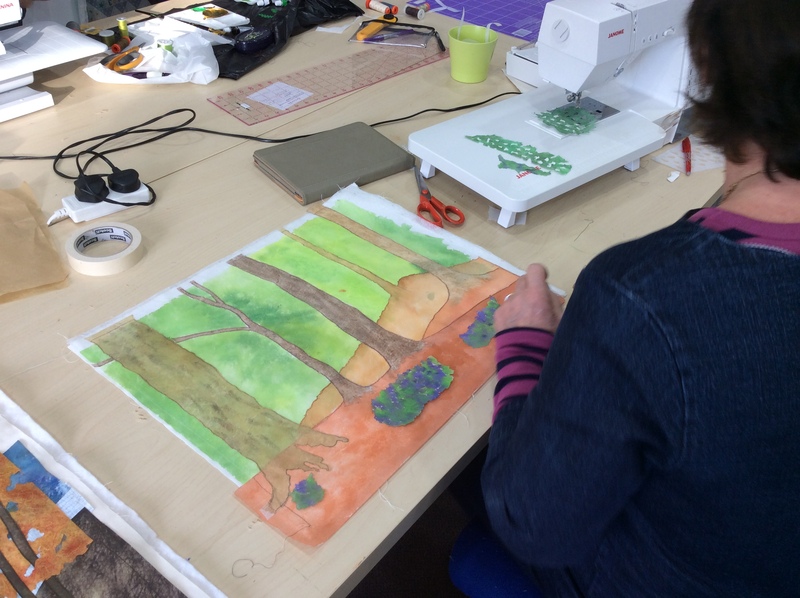 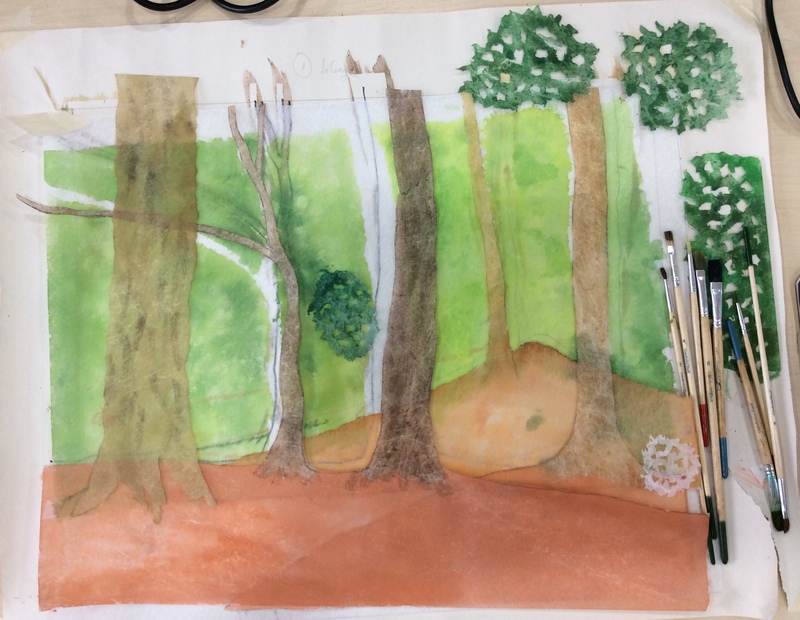 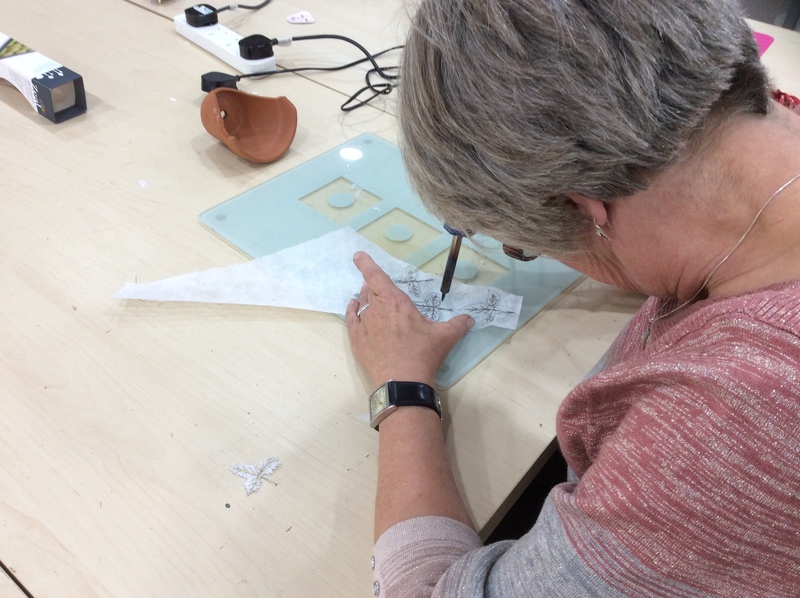 Here are just a few images from the show…..
At long last, after making 3 small quilts for the David Hockney Challenge and promising Mary from LINQS I would make a large one, I have finally made a start on it! 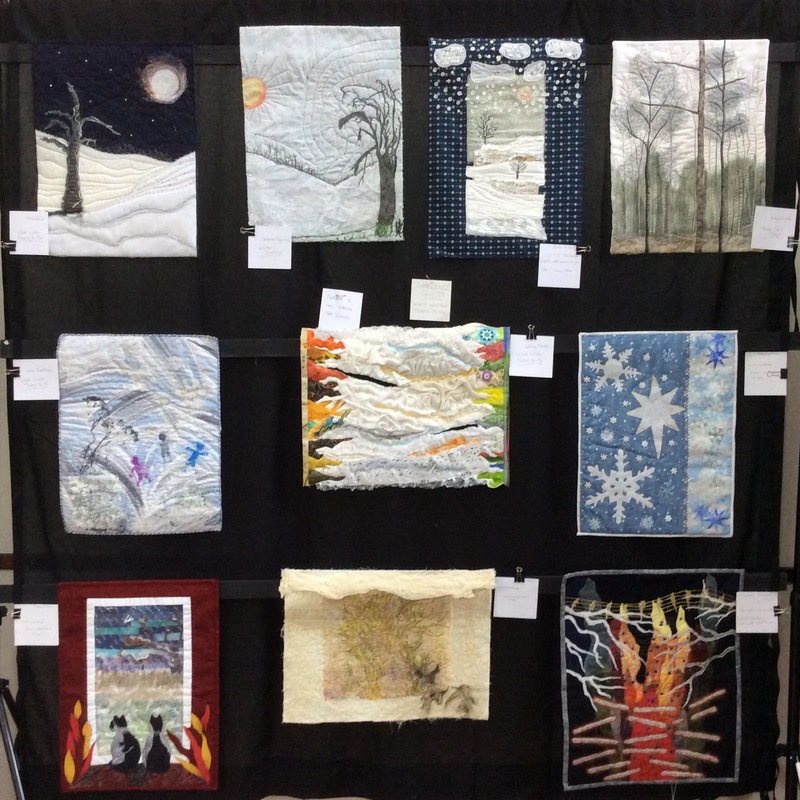 It’s going to be a scaled up version of the quilt I made at the Cranwell Group earlier this year with the theme “what Winter means to me” (20″x 15″). 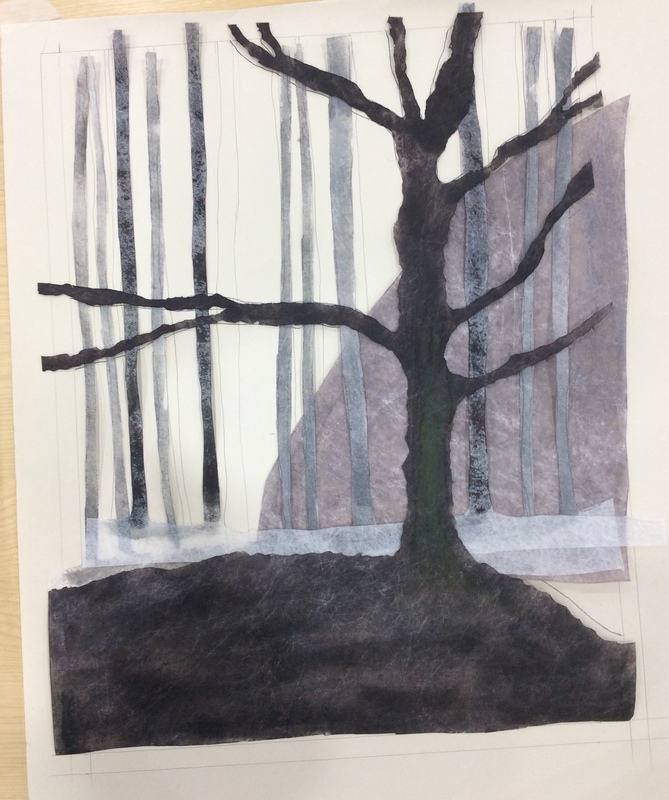 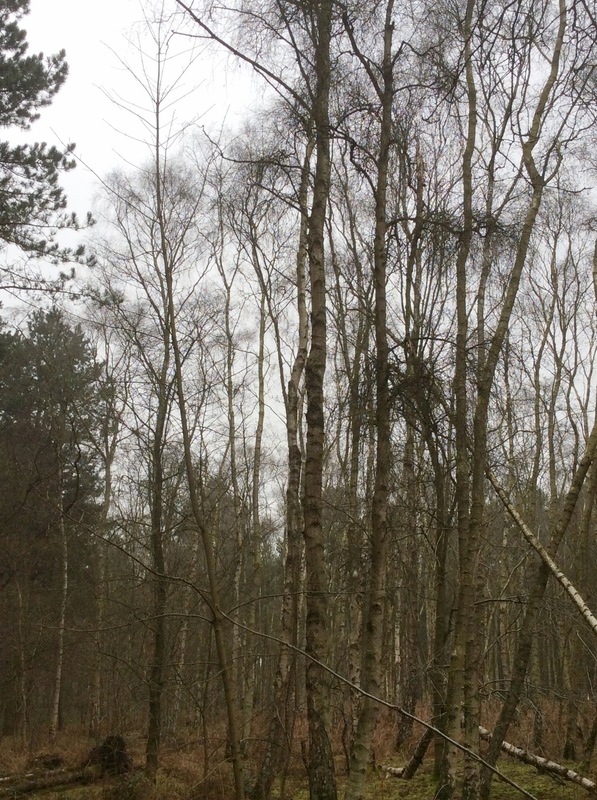 Last Winter had been all about trees as far as I was concerned. 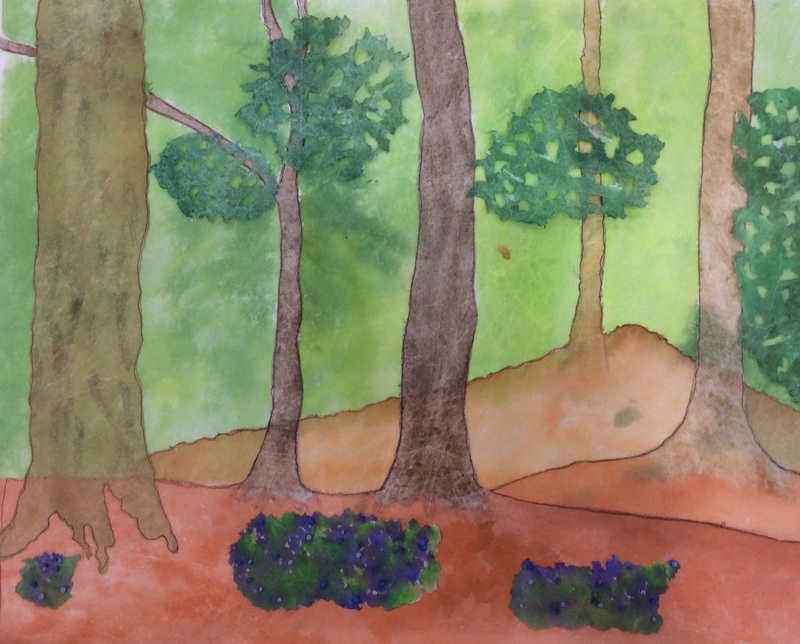 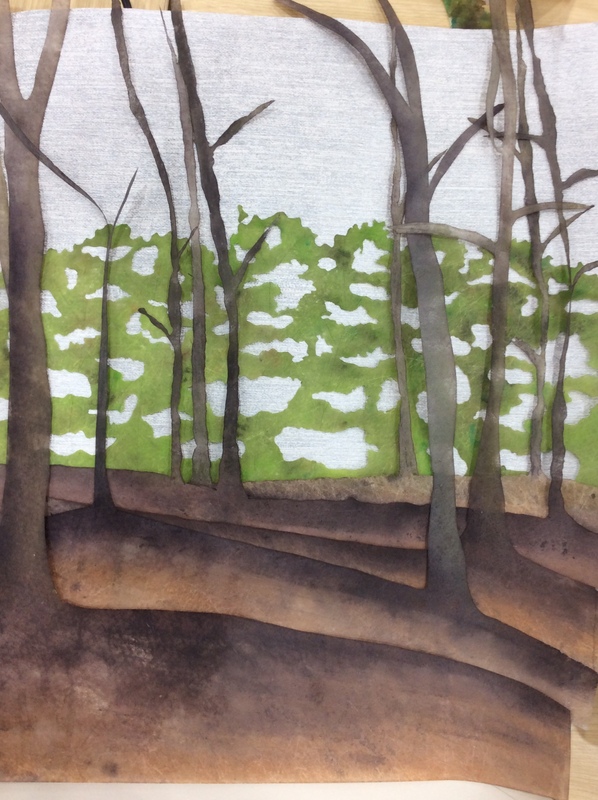 Researching Hockney’s work led to me developing a fascination of my own for trees and woodlands and I began photographing them wherever I went. 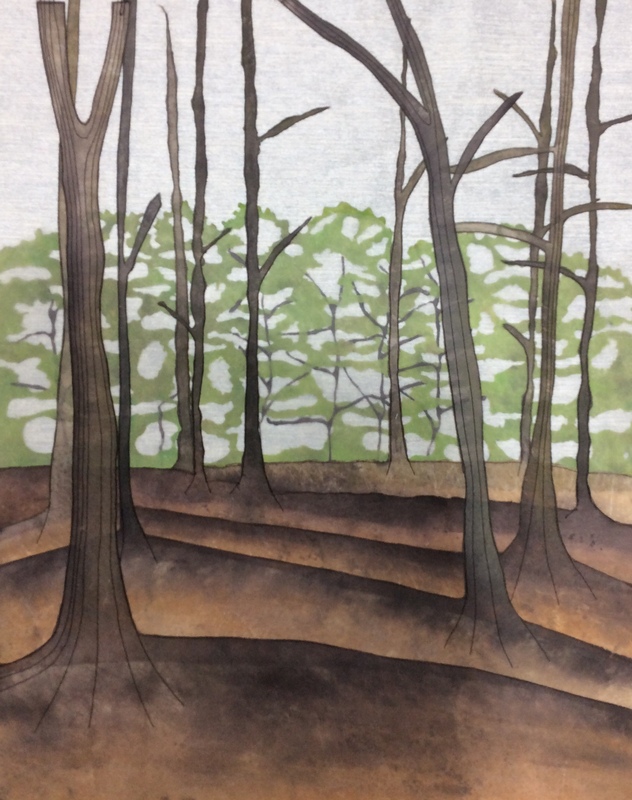 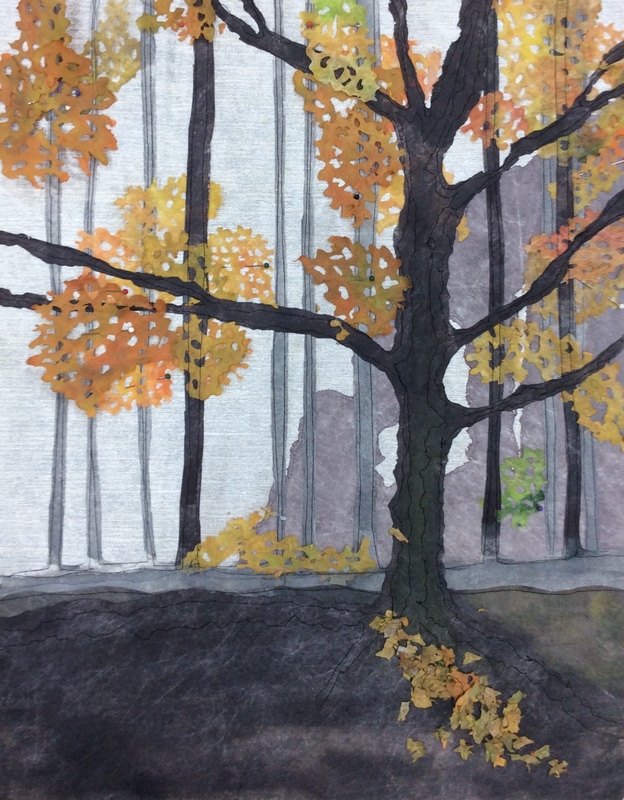 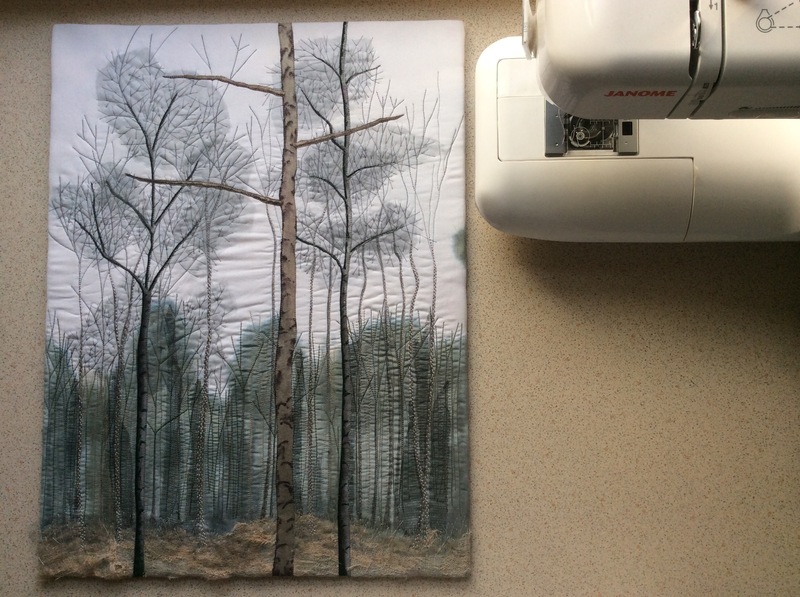 This quilt is based on a photograph I took while out walking in the woods at Woodhall Spa. 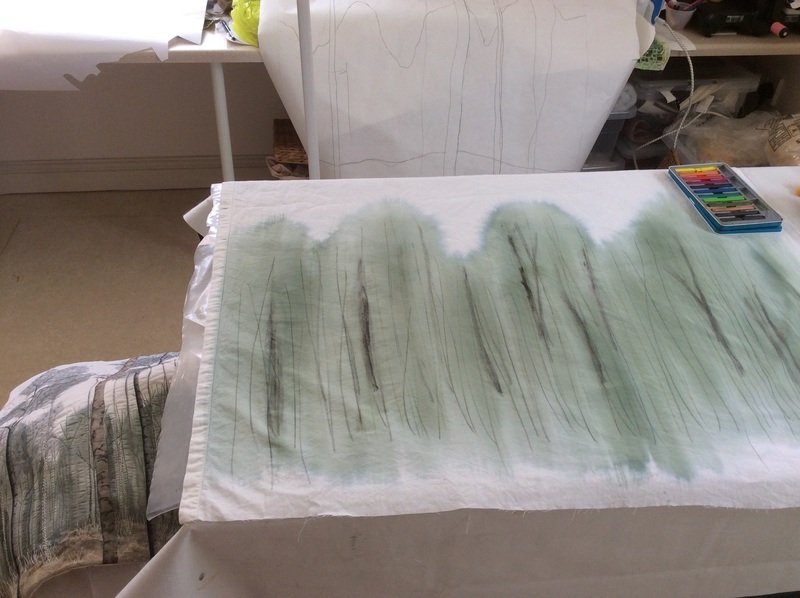 I began by soda soaking my fabric prior to dyeing with Procion from Artvango. 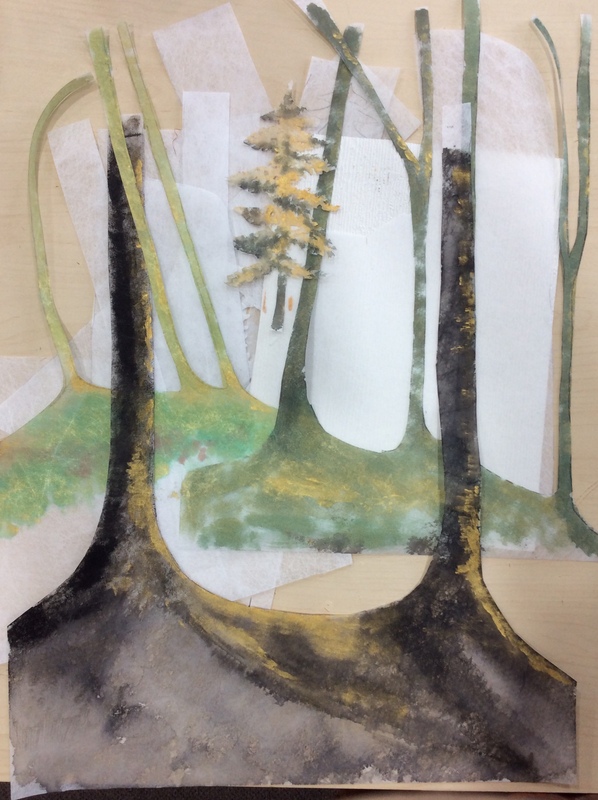 Unfortunately I think I must have used too much soda. 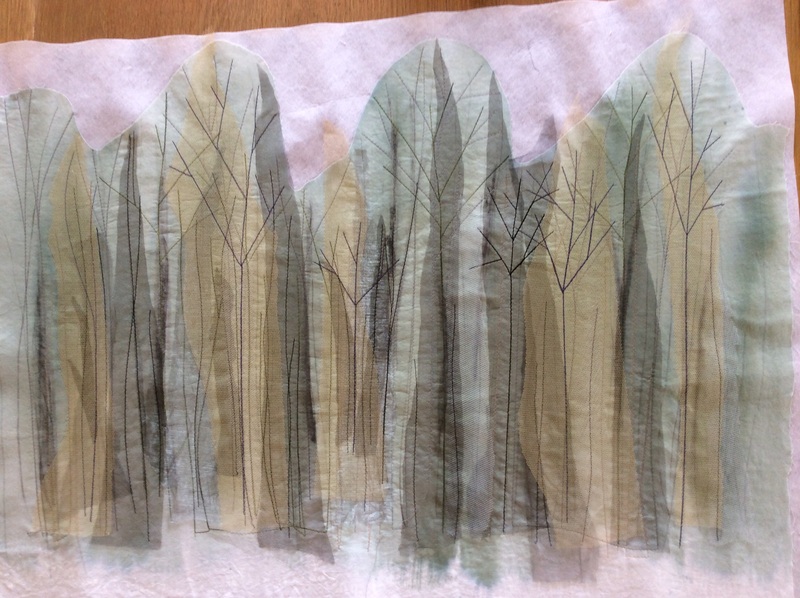 Although I covered it before ironing I still managed to burn the entire area of fabric above the tree tops! 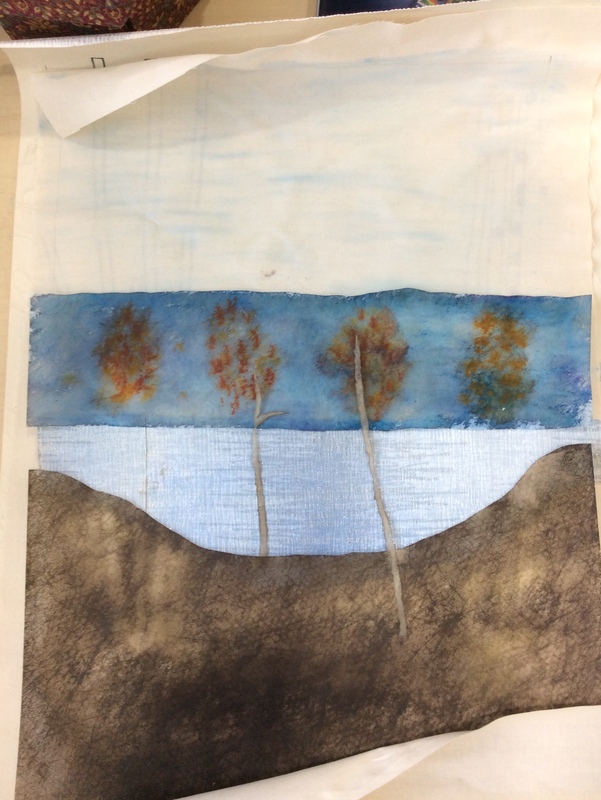 The dyed area was fine, just the white space above was burnt. 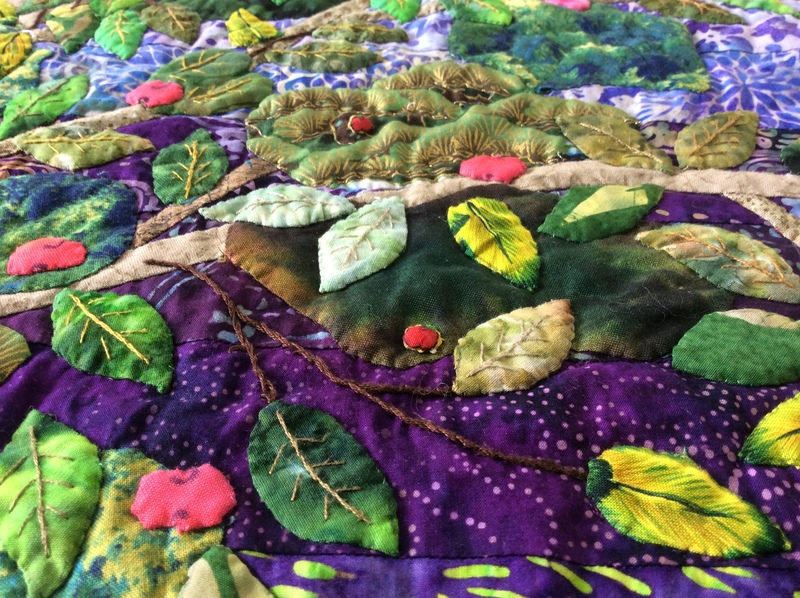 I decided, rather than start again, to cut out the trees, back them with Vilene and make a huge piece of appliqué. 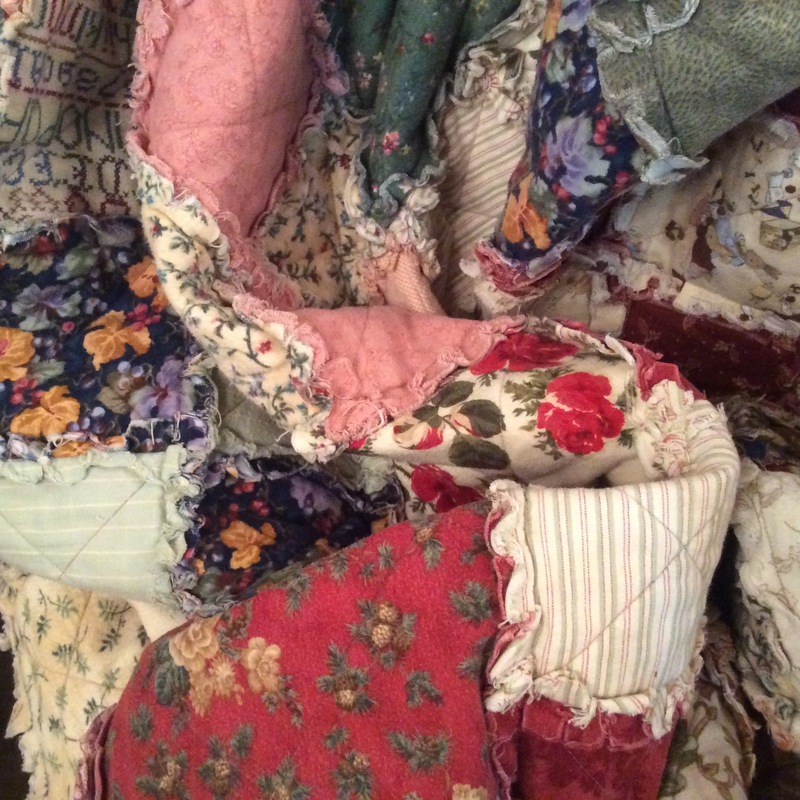 This turned out to be a blessing in disguise as it was so much easier to handle under the machine than the whole cloth would have been! 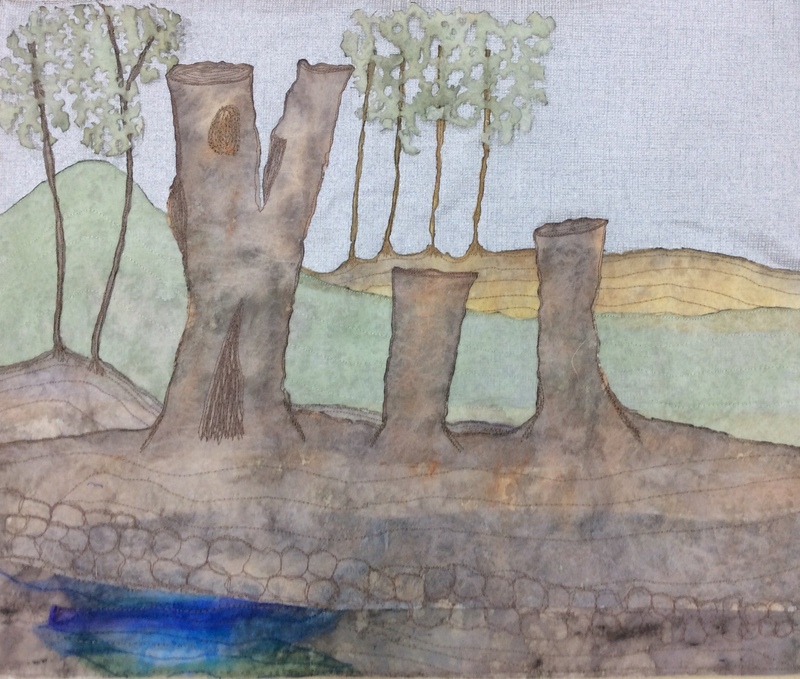 Coloured with Procion and Inktense…..prior to burning! 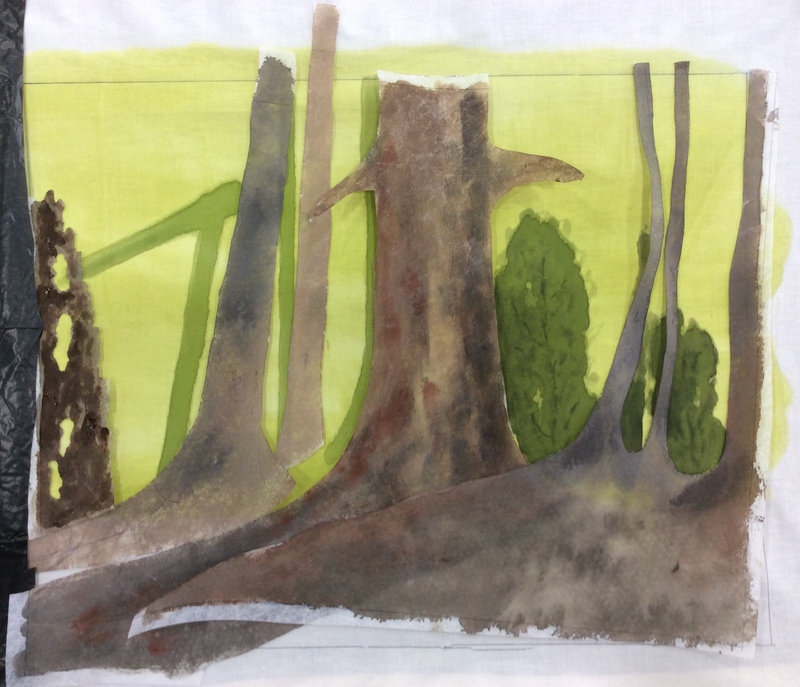 I’ve layered organza and netting and machine stitched the background trees in various coloured threads, the same way as I did for the smaller version, but this time using more variety of colours. 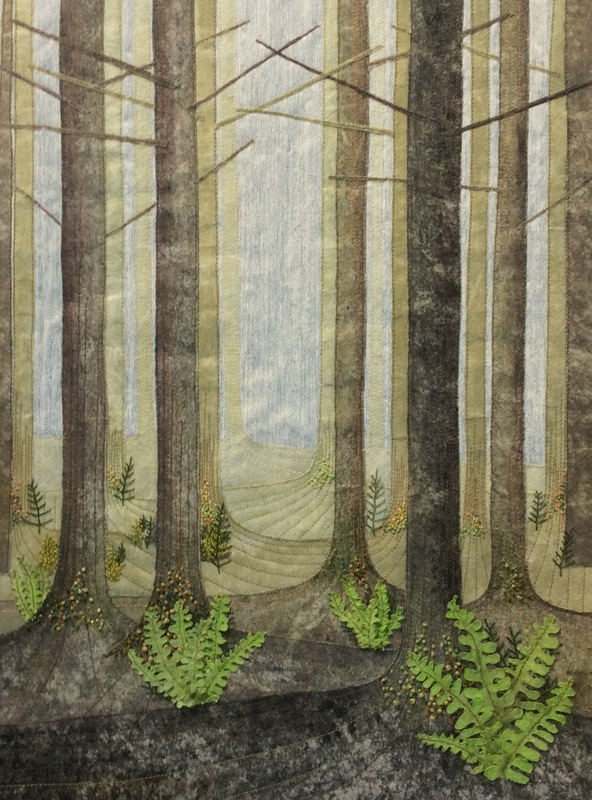 The next step was to add the woodland floor before layering my appliqué woodland, sky fabric and wadding. 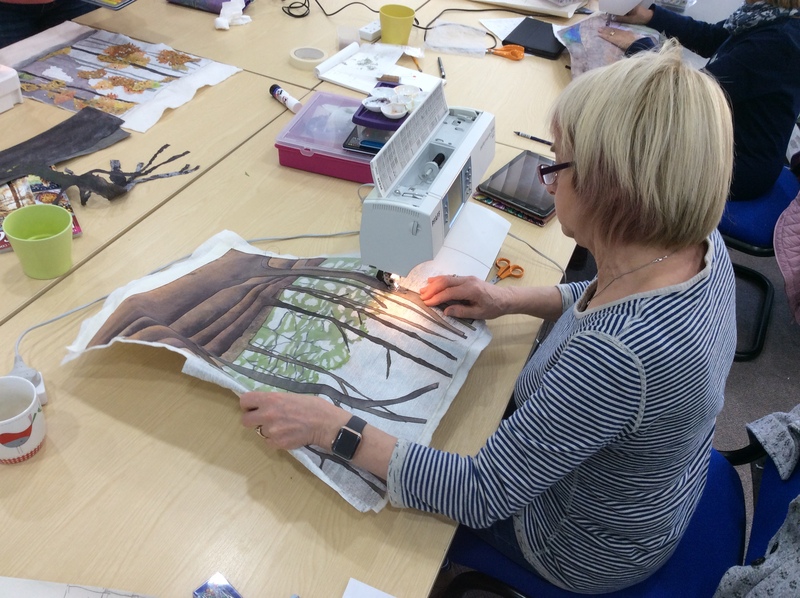 The foreground trees have now been tacked in position and can be machined once the finer branches have been hand sewn. 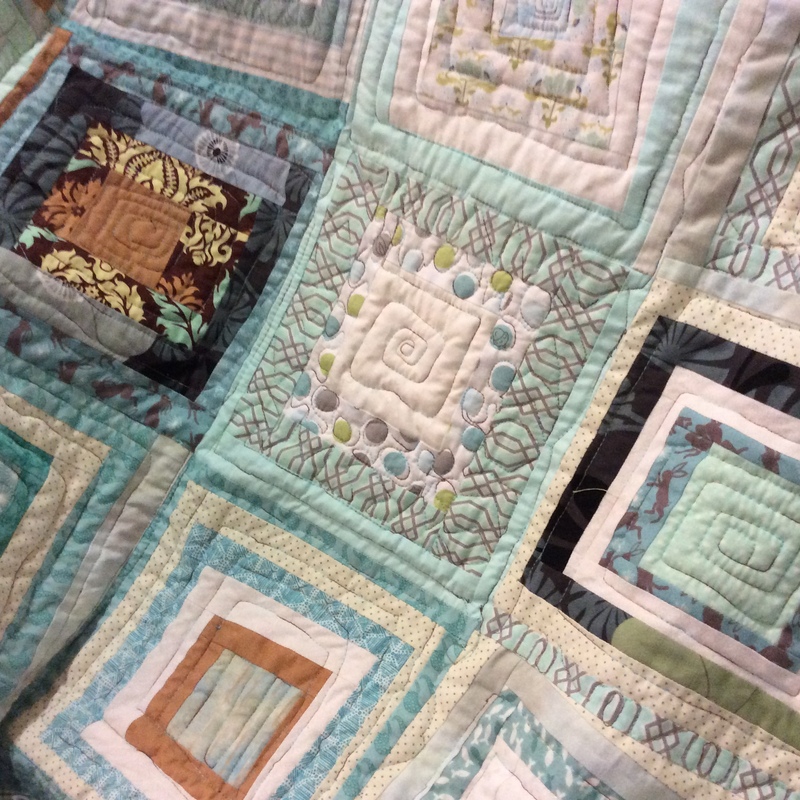 I’m not particularly looking forward to quilting the three tall trees in place as the quilt sandwich is already very bulky. 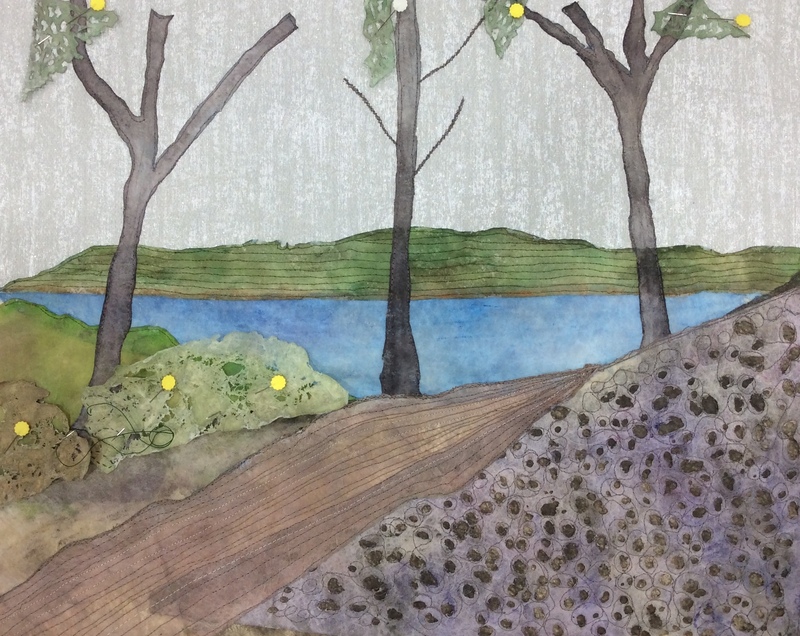 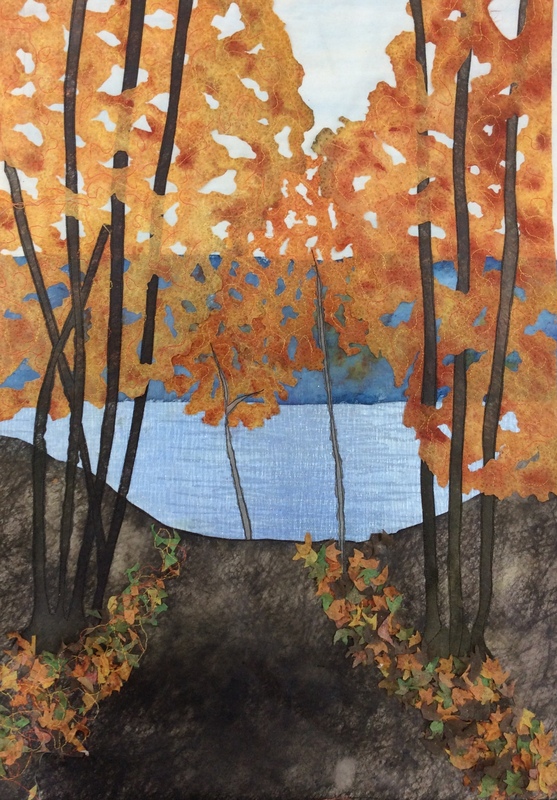 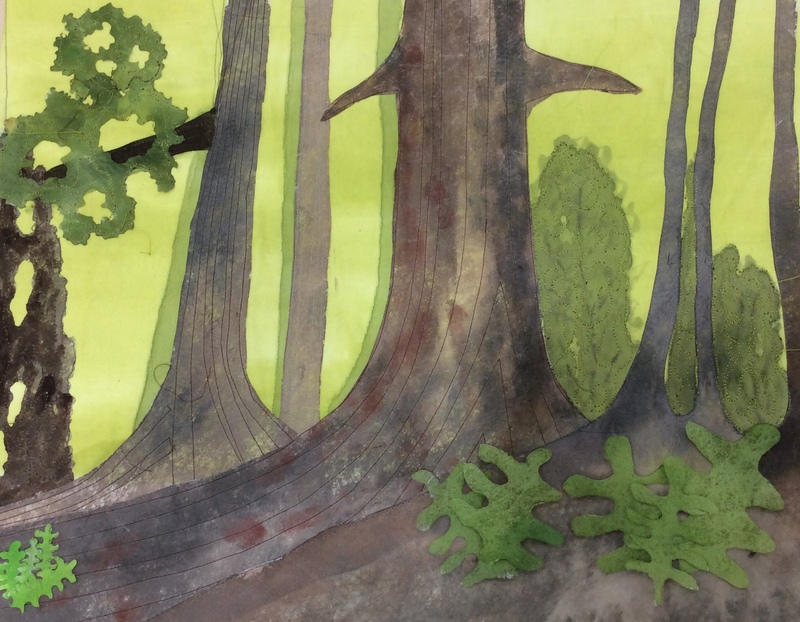 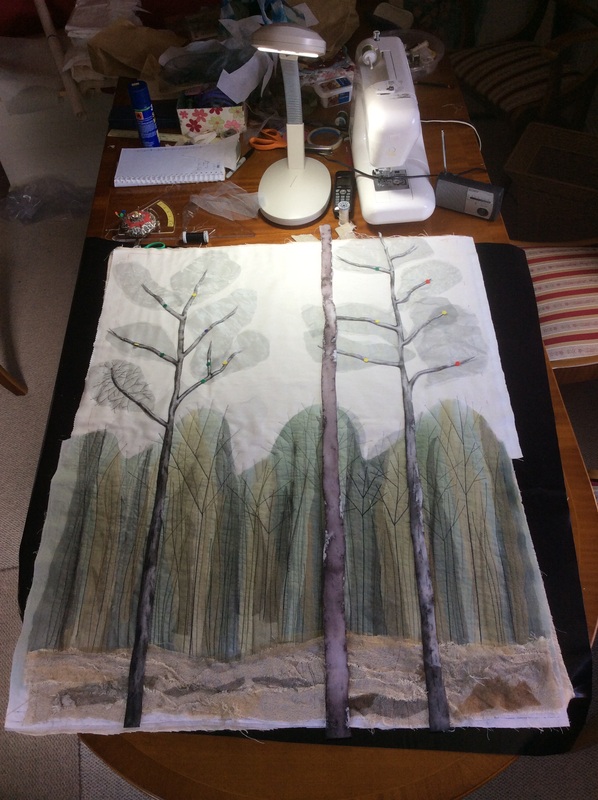 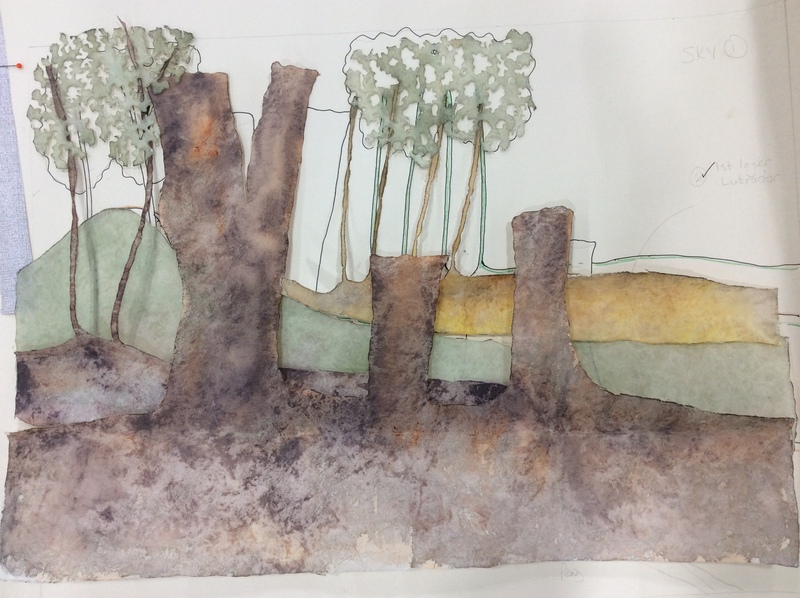 With hindsight I should have sewn the three trees on to the “sky” layer before I started quilting……..another lesson learnt!